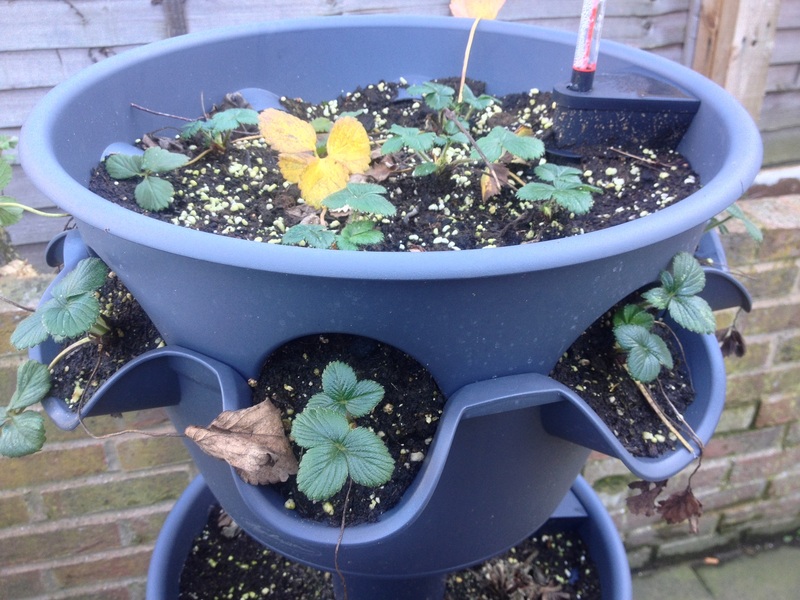 3-tier planter with flowering and fruiting Flamenco strawberry plants in top tier. 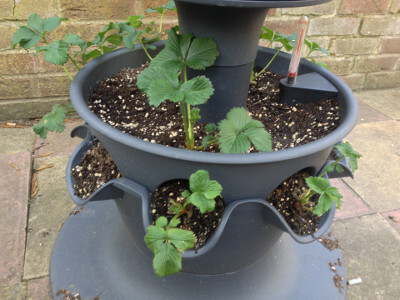 Maincrop strawberries in middle and bottom tiers are putting out runners, and there are runners pinned into pots sitting on the base of the planter. Top tier planter with everbearing Flamenco strawberry plants that should continue flowering and fruiting until November. 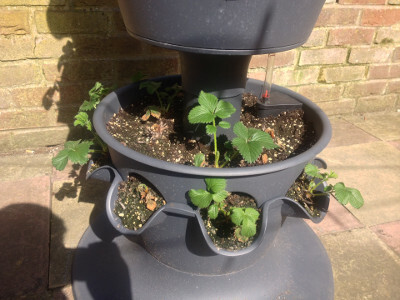 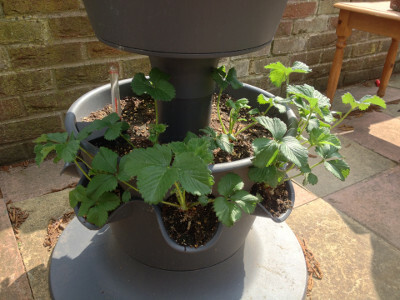 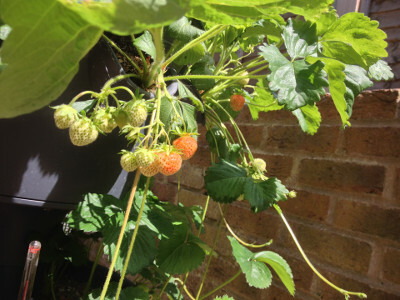 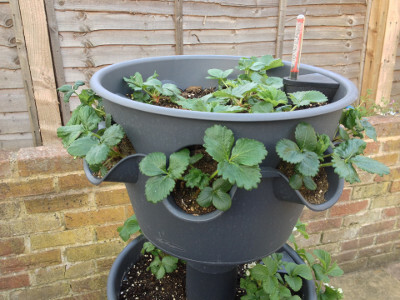 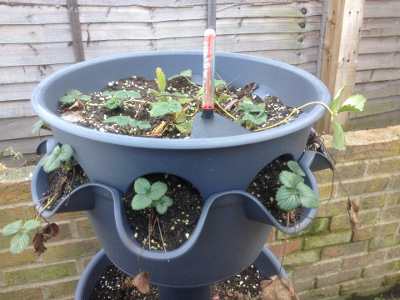 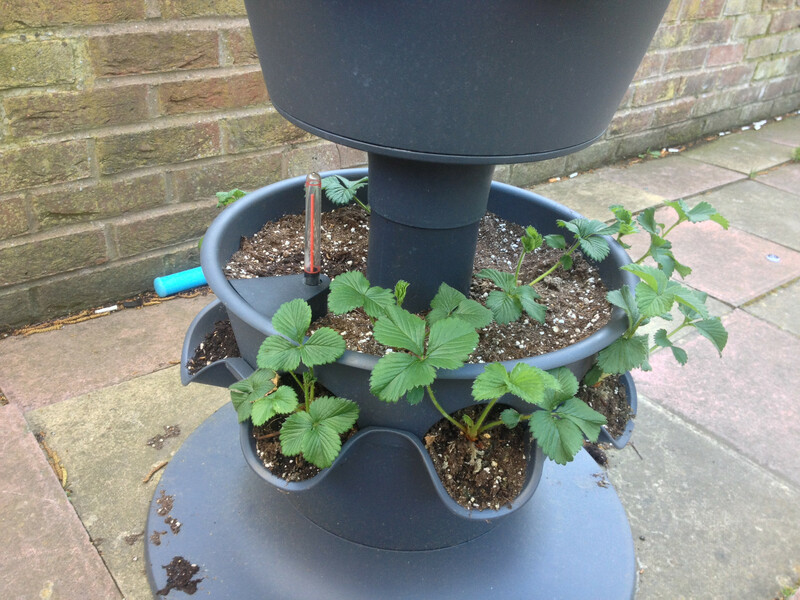 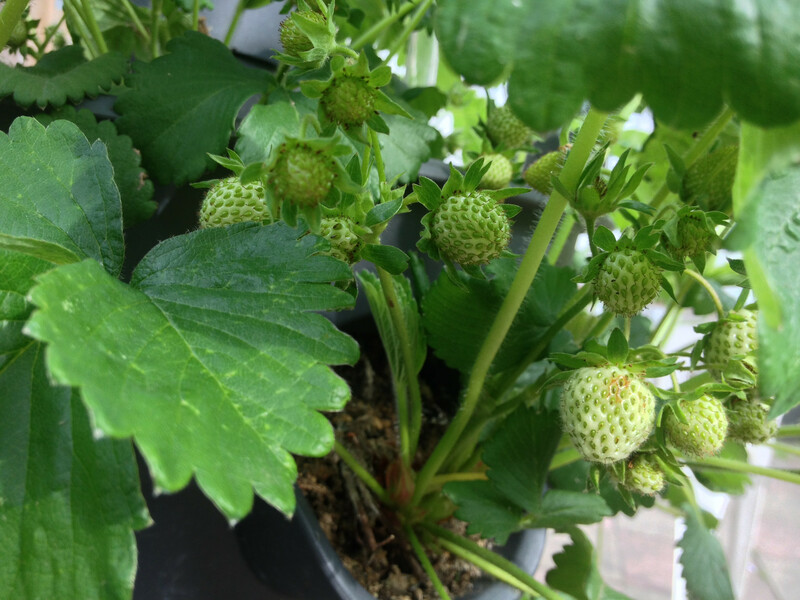 Middle tier planter with maincrop Cambridge Favourite strawberry plants have finished fruiting. Once I have propagated enough plants from the runners I will start cutting off new runners. Bottom tier planter with maincrop Florence strawberry plants have finished fruiting. 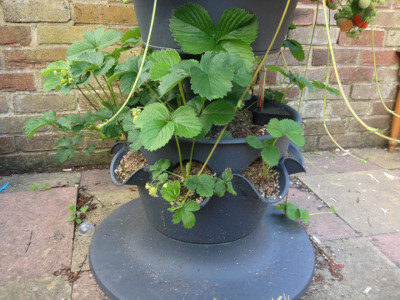 Around the base of the planter are Cambridge Favourite and Florence runners pinned into pots. 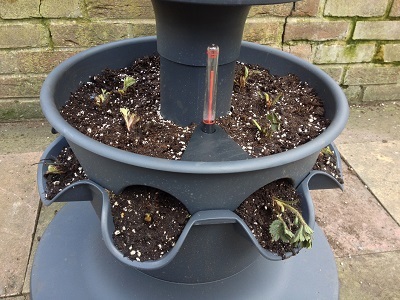 Once I have propagated enough plants from the runners I will start cutting off new runners. 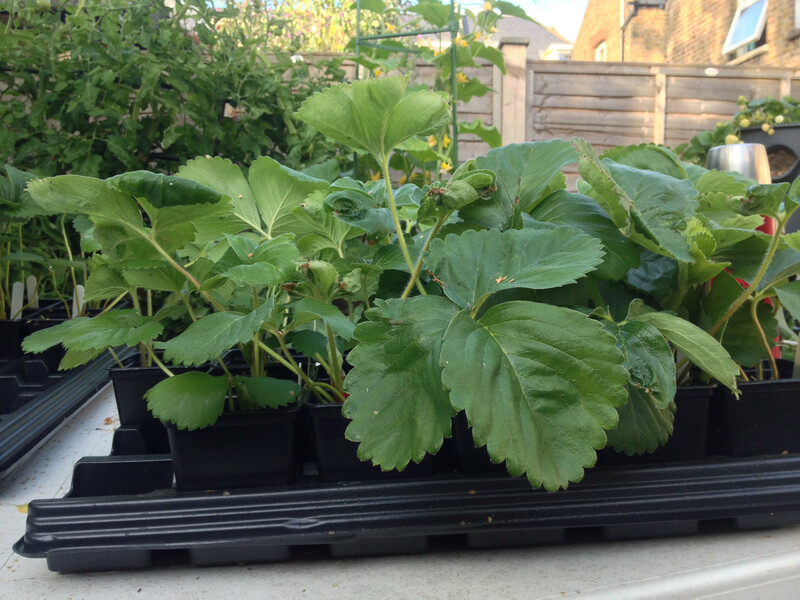 Sixteen Cambridge Favourite 'daughter' strawberry plants. 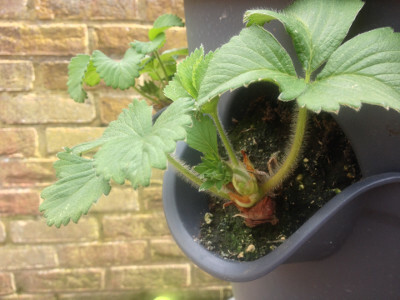 I pinned the runners into pots using garden staples, removed the staples when the roots were deep enough (slight pulling on the runner showed the roots were securing it), and snipped the runner when there were at least 3 leaves and the roots could be seen through the drainage holes. 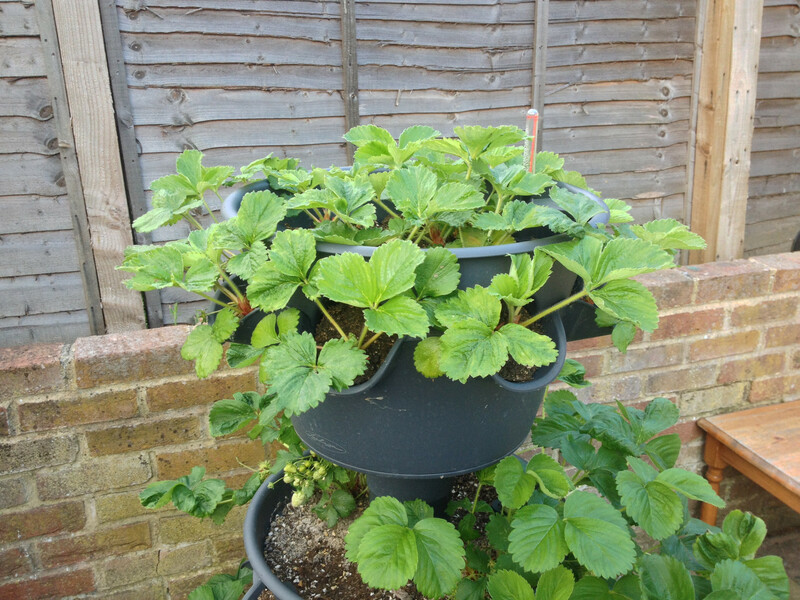 Seven Florence 'daughter' strawberry plants. I pinned the runners into pots using garden staples, removed the staples when the roots were deep enough (slight pulling on the runner showed the roots were securing it), and snipped the runner when there were at least 3 leaves and the roots could be seen through the drainage holes. 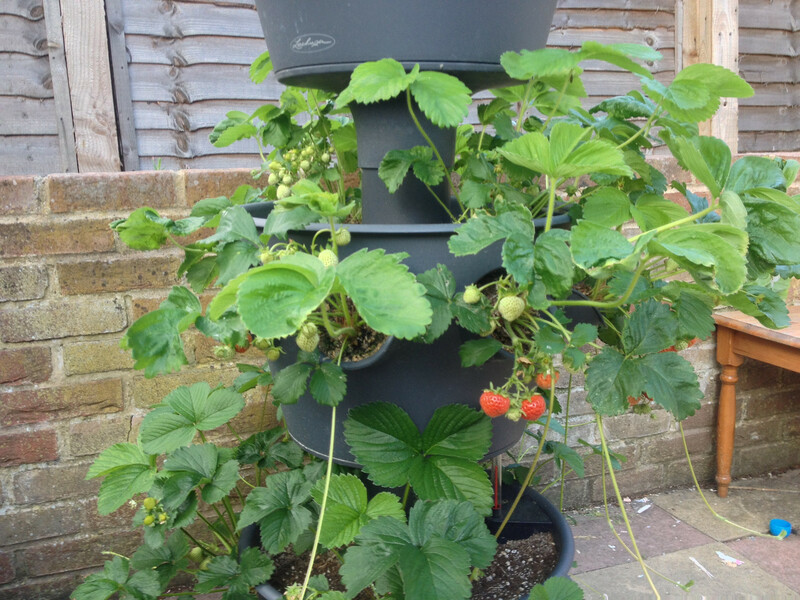 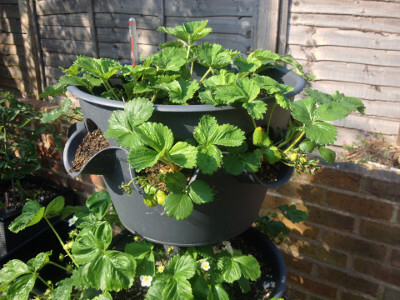 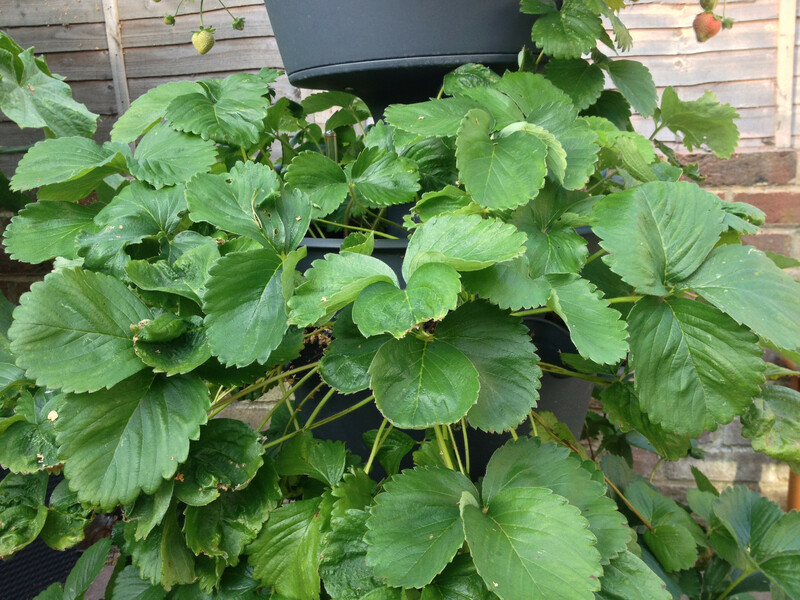 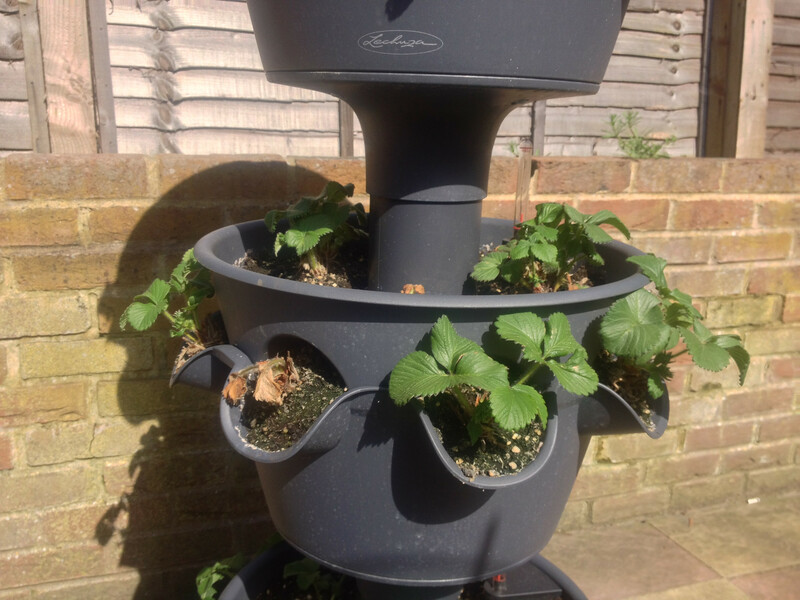 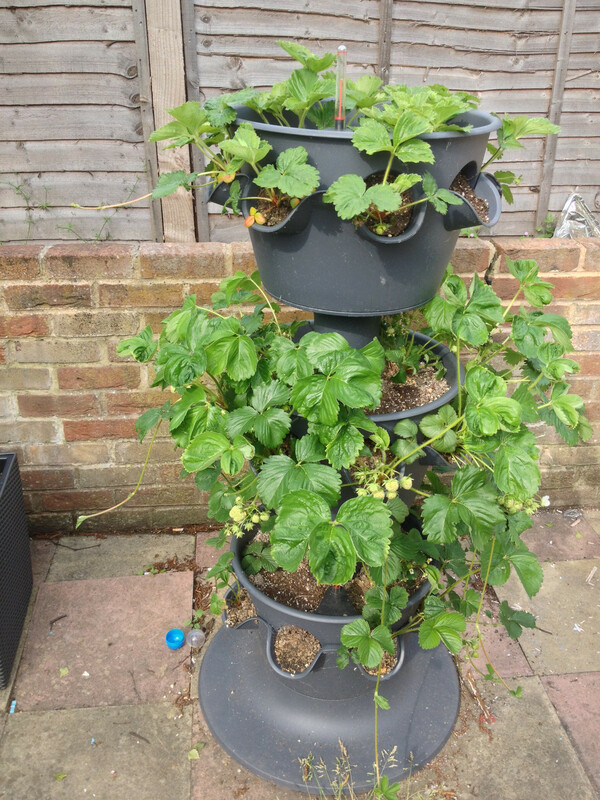 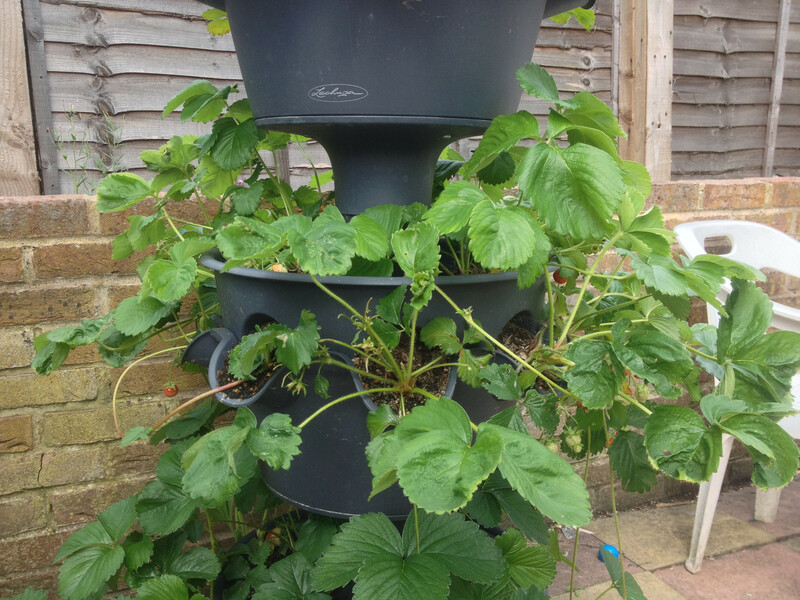 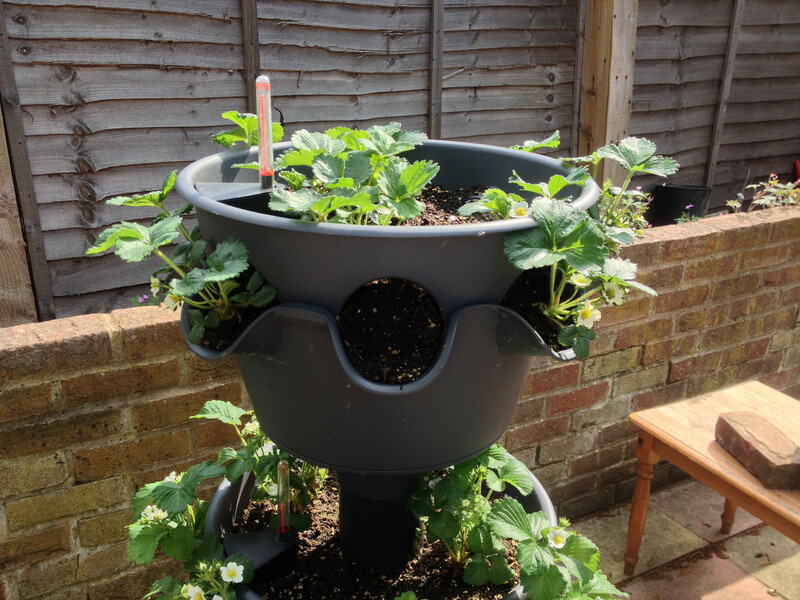 3-tier planter with the last of the Cambridge Favourite and Florence maincrop strawberries ripening. 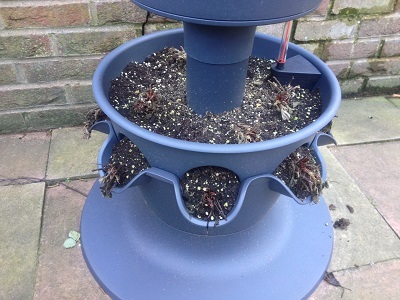 Quite a few runners/stolons, some of which are pinned into 3 inch pots. 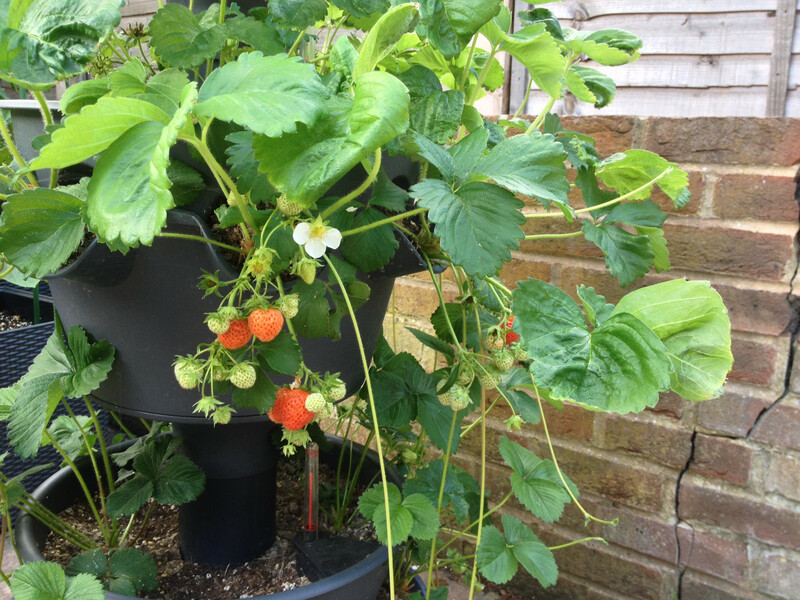 The Flamenco plants are flowering and fruiting again for a second crop this year. 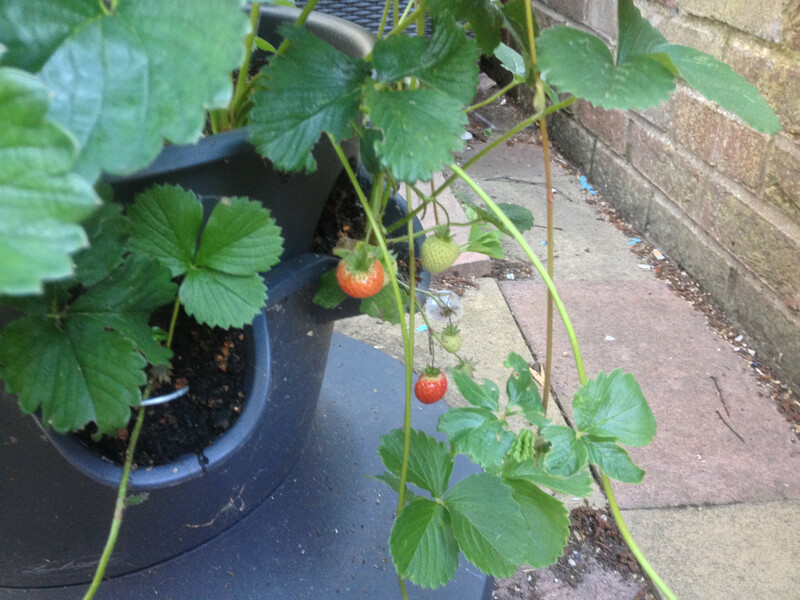 Some of the last Cambridge Favourite strawberries of the year are ripening. 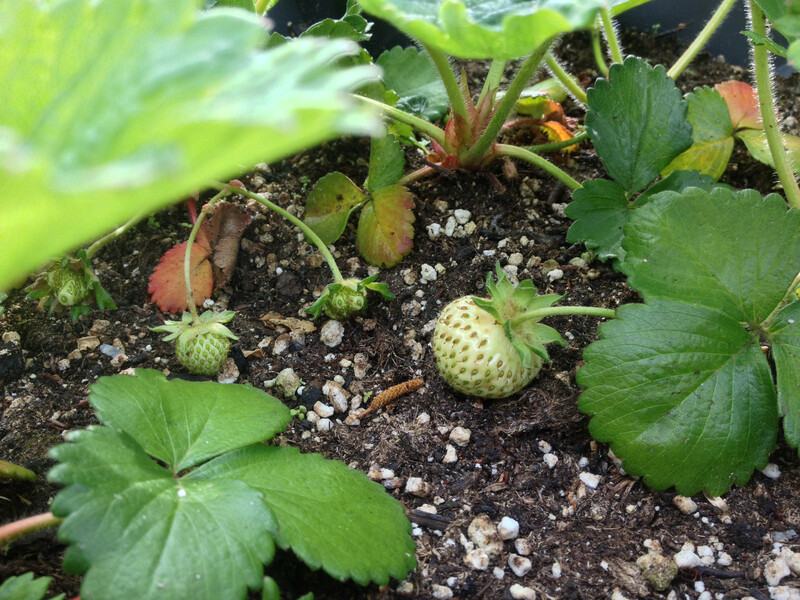 Some of the last Florence strawberries of the year are ripening. 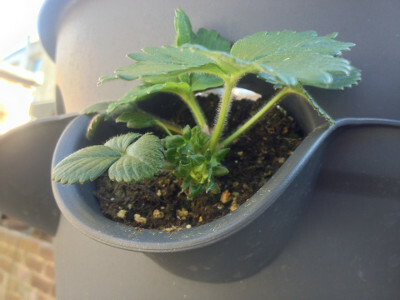 Some more runners need pinning into pots. 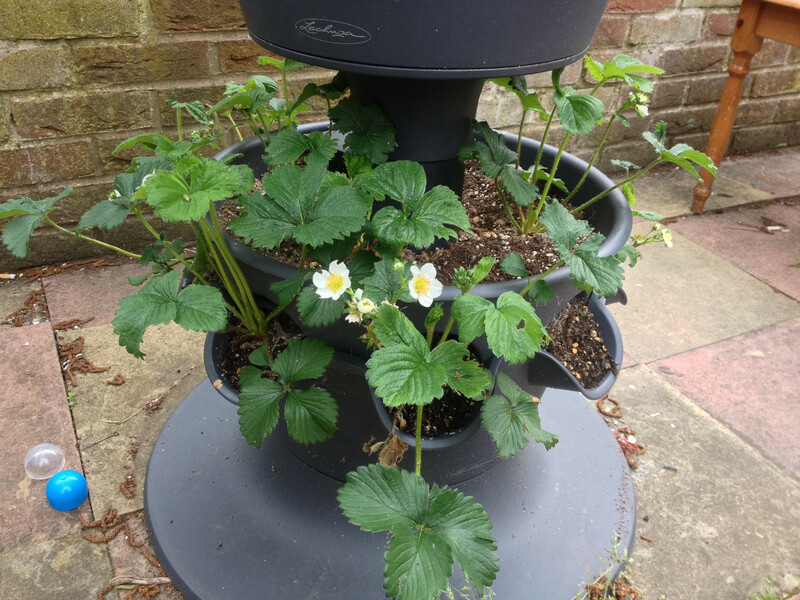 3-tier planter with some Cambridge Favourite and Florence maincrop strawberries fruiting, and the everbearer Flamenco strawberry plants flowering again. 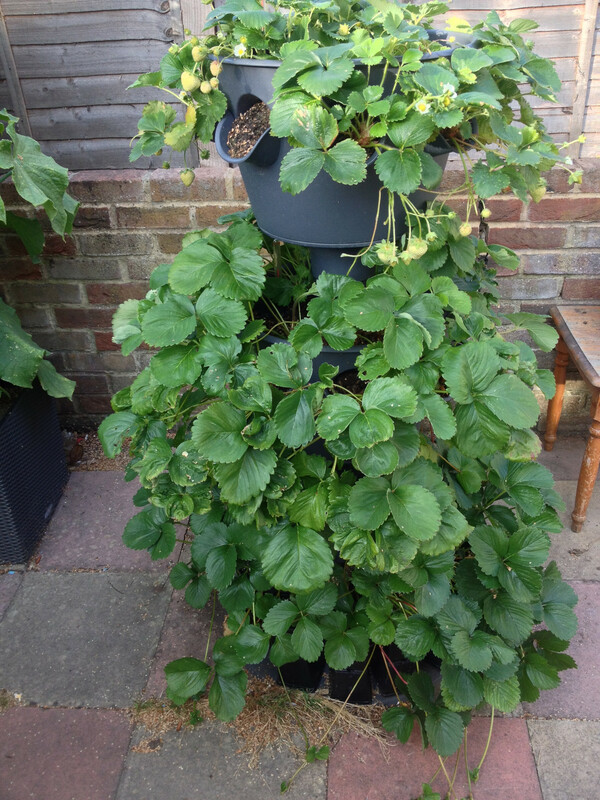 Top tier planter with Flamenco strawberry plants starting to flower for a second time this year. 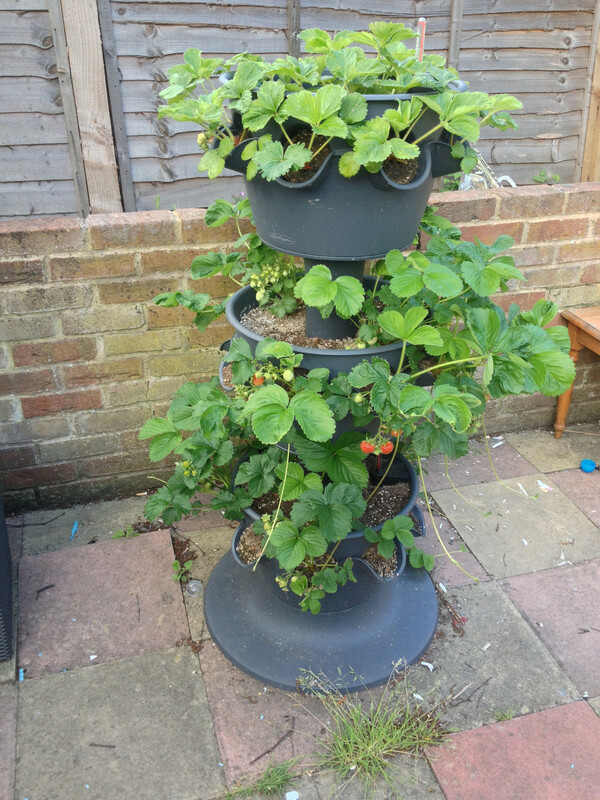 Middle tier planter with some Cambridge Favourite strawberries fruiting and some runners. 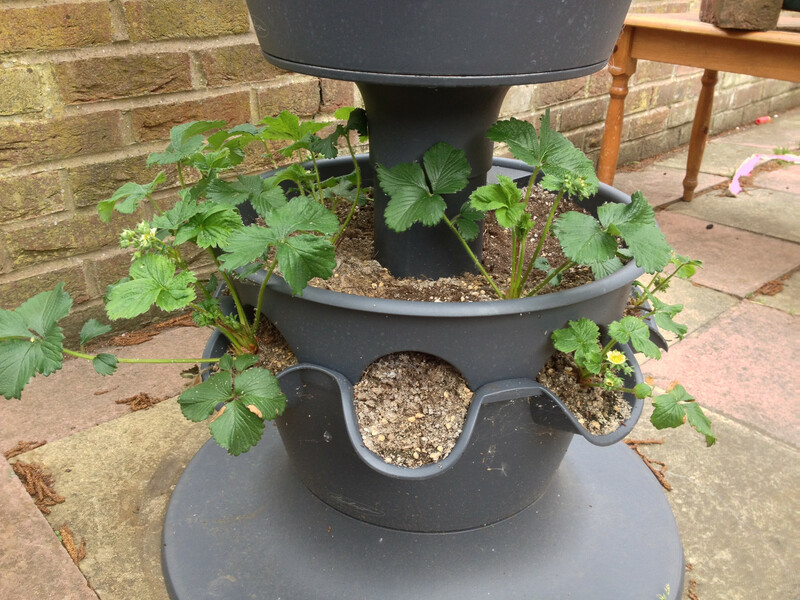 Bottom tier planter with some developing Florence strawberries, and few runners. 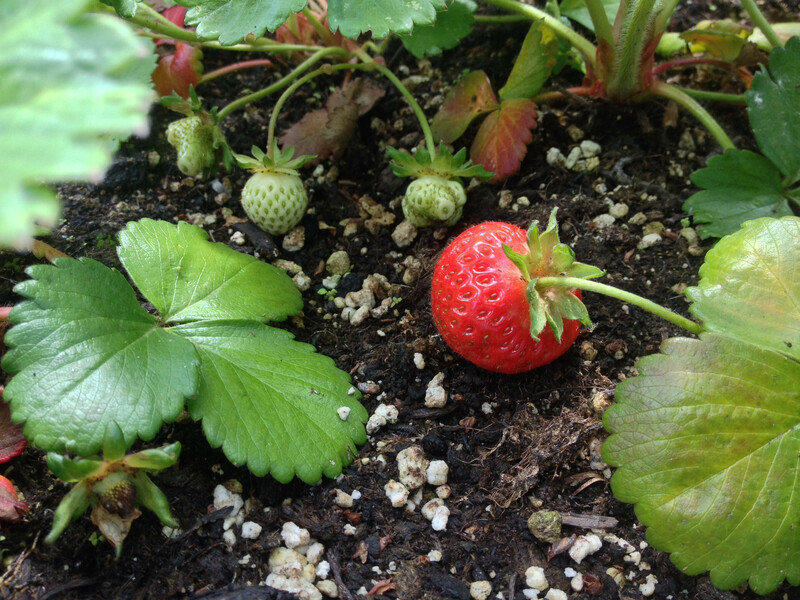 Today's strawberry harvest: 77 grams of Cambridge Favourite strawberries. 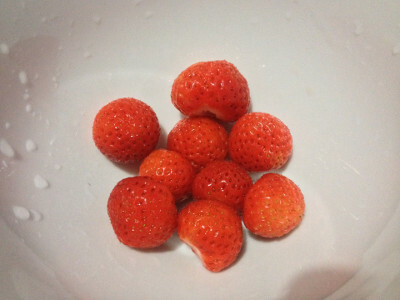 Rinsed, tops removed, and placed in a bowl. 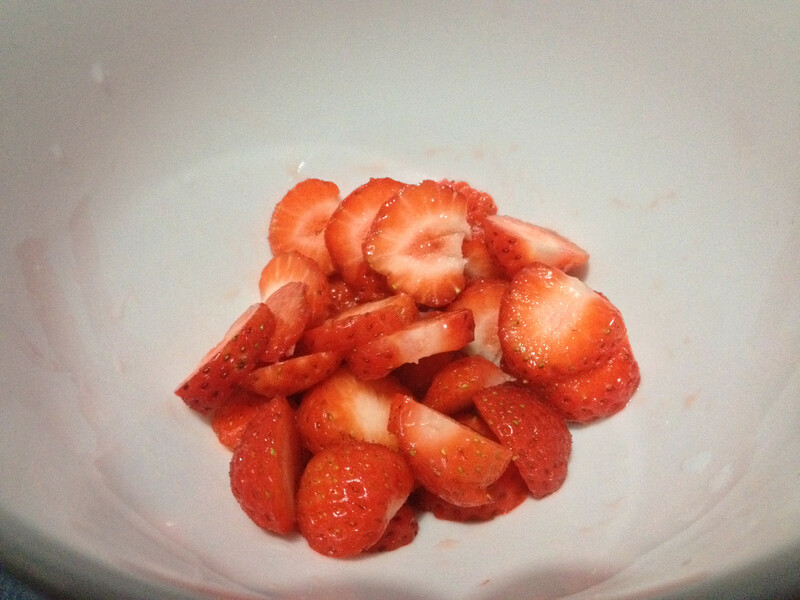 Today's strawberry harvest: 77 grams of Cambridge Favourite strawberries, sliced. 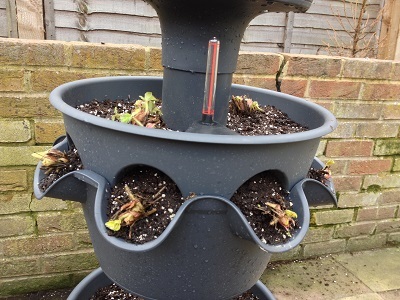 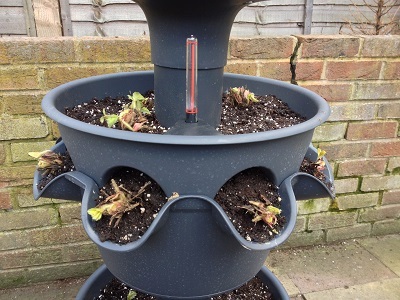 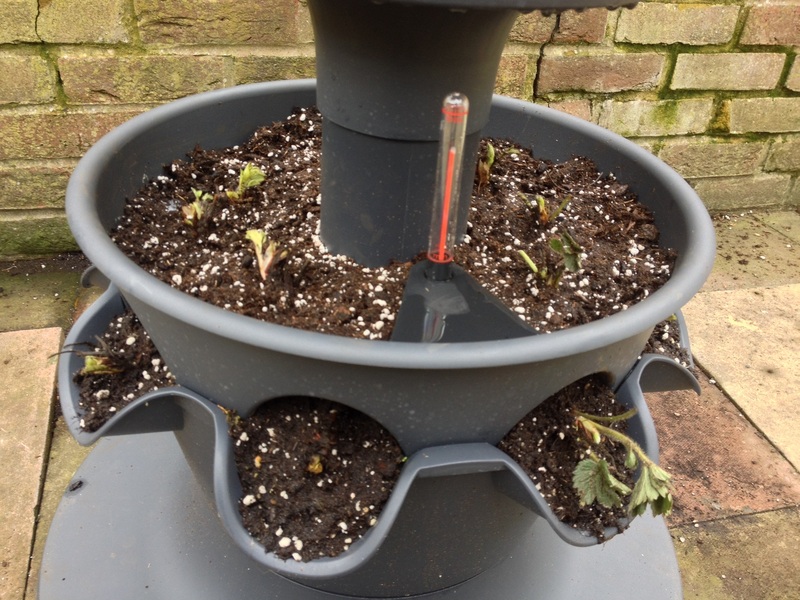 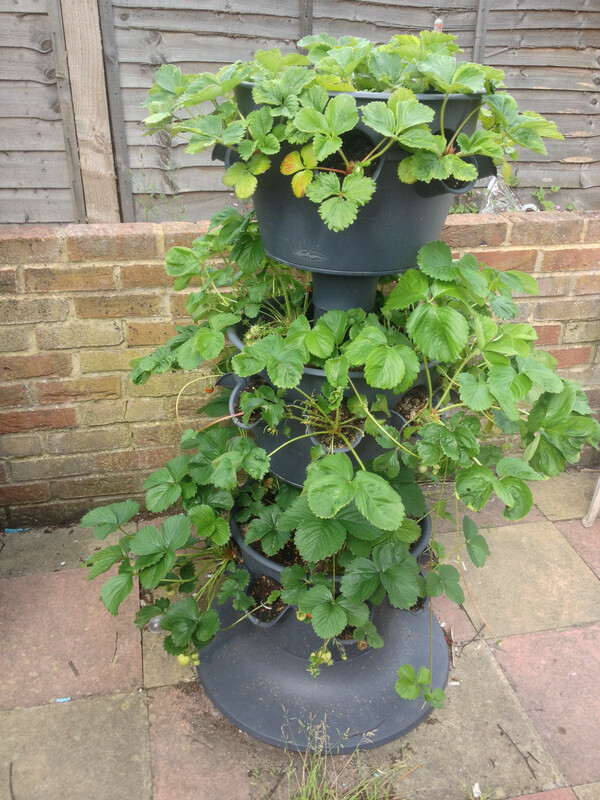 3-tier planter with strawberries developing in all 3 tiers, and with older leaves that turned red or brown removed. Top tier with some Flamenco strawberries developing. 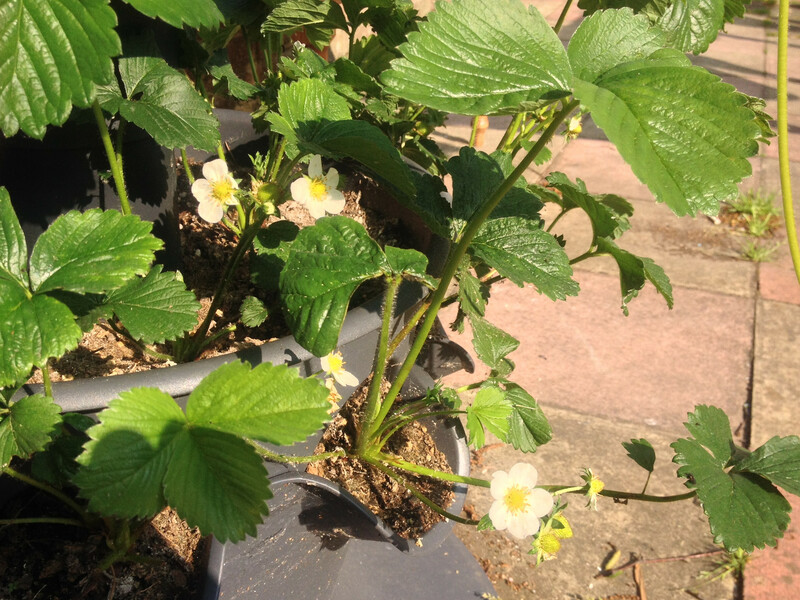 A number of plants have not put out any flowers yet. 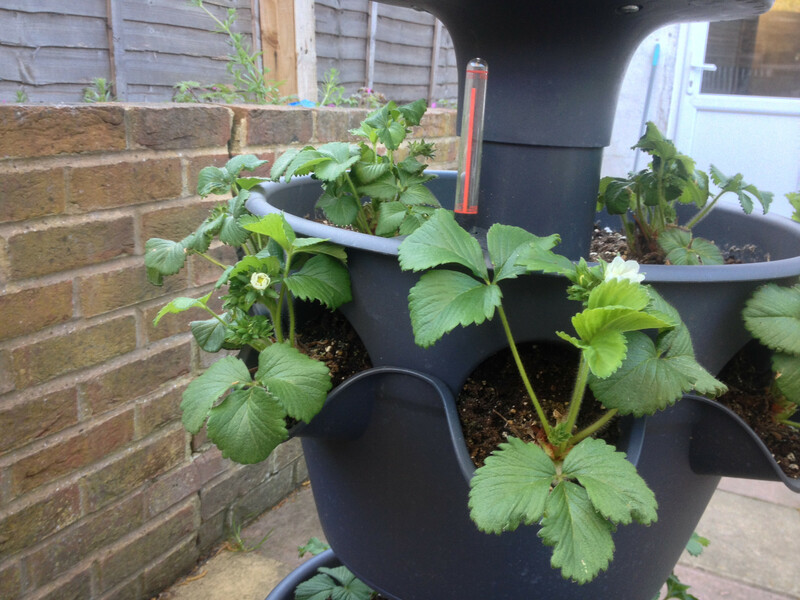 Middle tier with developing and ripening Cambridge Favourite strawberries, a few flowers and pollinated flowers, and some runners/stolons. Bottom tier with some developing Florence strawberries and some flower buds. Some plants have not flowered. 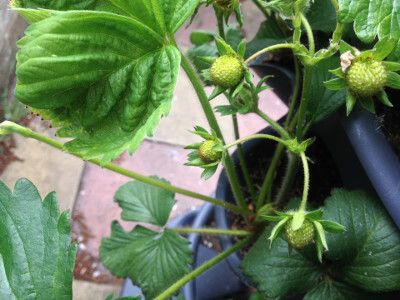 Some developing Flamenco strawberries, two of which are misshapen and starting to ripen. 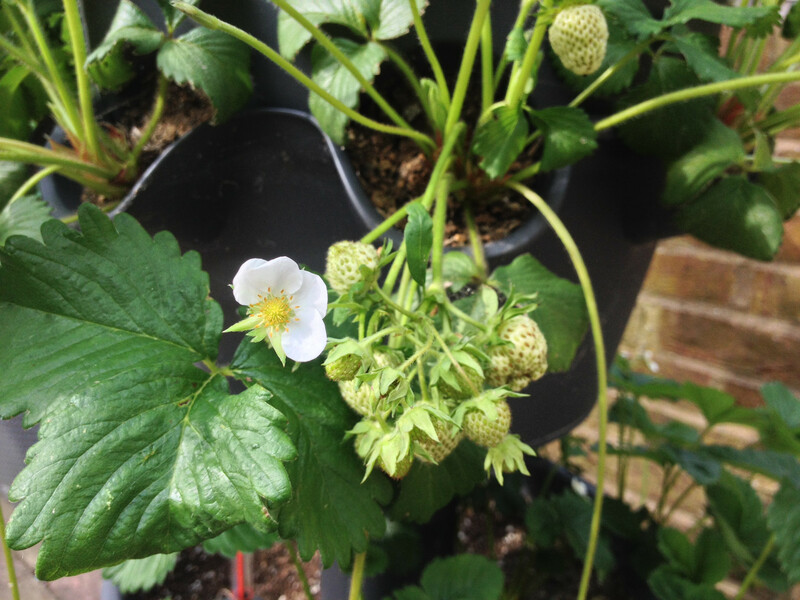 Cambridge Favourite strawberry plants with some developing and ripening strawberries, flowers and pollinated flowers, and runners/stolons. 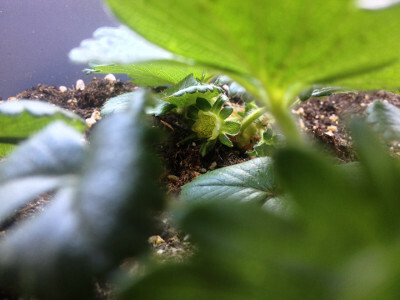 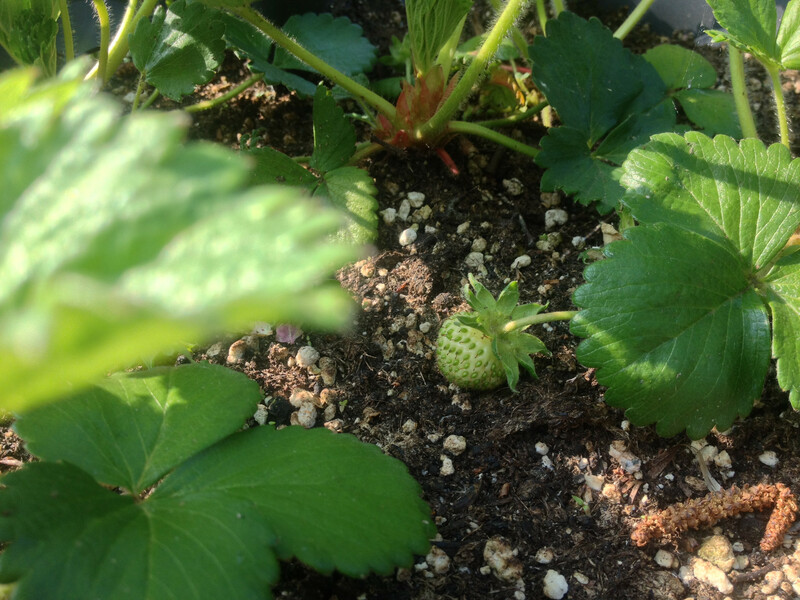 Some developing Florence strawberries, flowers, pollinated flowerrs, flower buds, and runners/stolons. 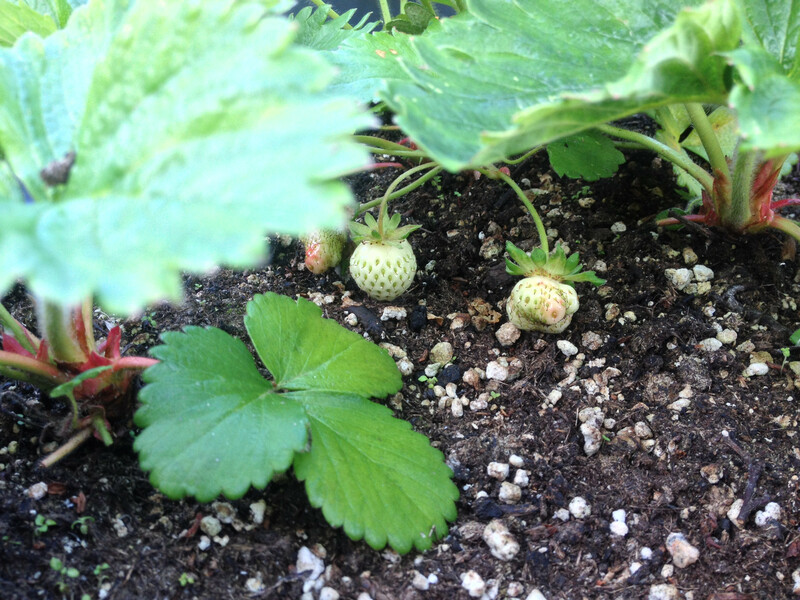 Some developing Flamenco strawberries including one that is close enough to fully ripe. This side of the berry has only been getting light since yesterday - it is a little lighter and some of the seeds are still orange. 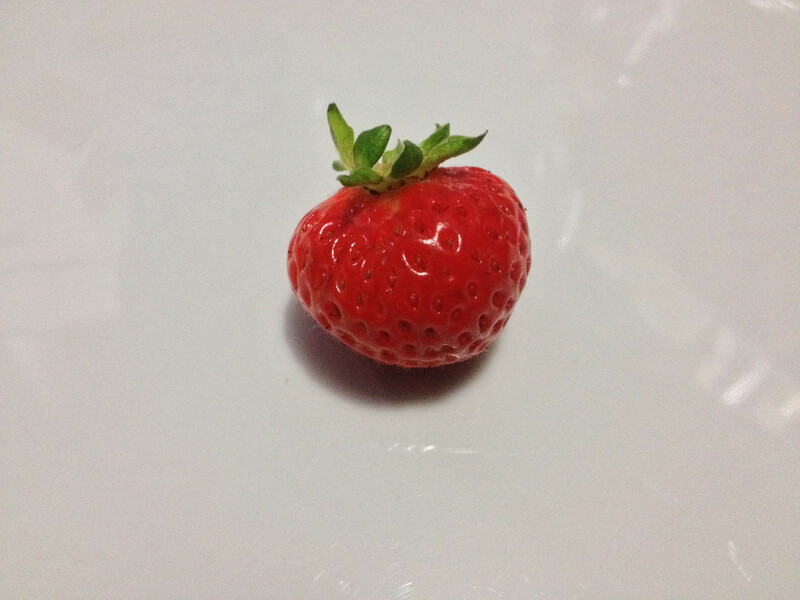 Virtually ripe Flamenco strawberry after running under water and dabbing dry with paper towel. 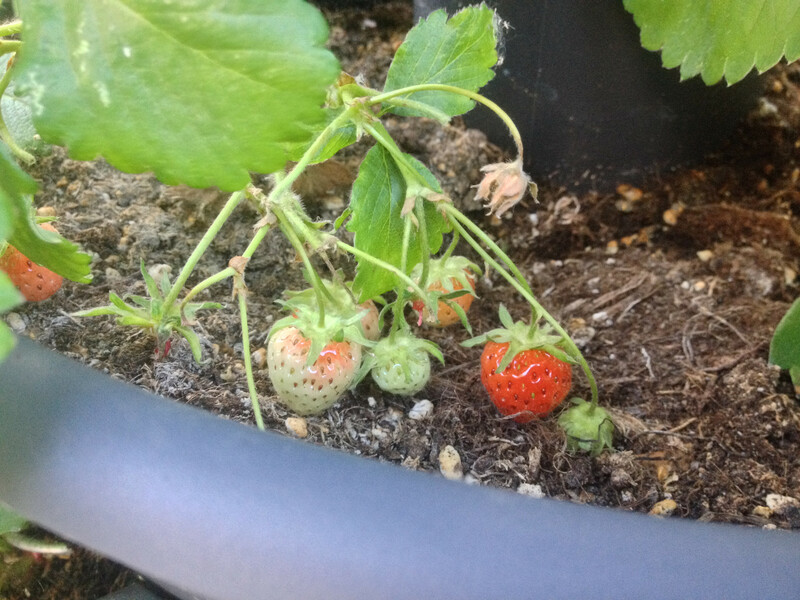 This side of the berry was facing upwards during most of the ripening period, is a consistent colour, and all the seeds are red. 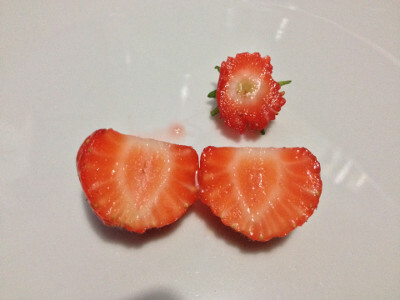 A nice juicy Flamenco strawberry with the top cut off and the berry cut in half vertically. If I had waited until tomorrow the berry could have been the same colour throughout. Sweet, and no fibrous (or missing) core. 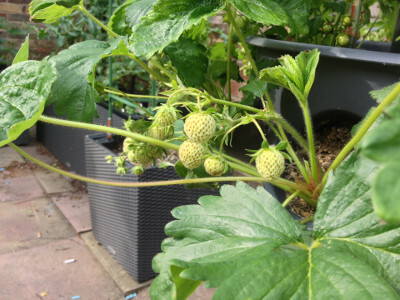 Some developing Flamenco strawberries including one that is almost ripe. 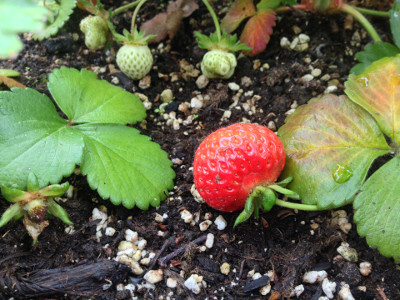 Cambridge Favourite strawberry plants with developing fruit, ripening fruit, and runners/stolons. 3 runners/stolons from Cambridge Favourite strawberry plants reaching down to the ground, each with two sets of leaves, and a runner/stolon (2nd from left) reaching down from a Florence strawberry plant. 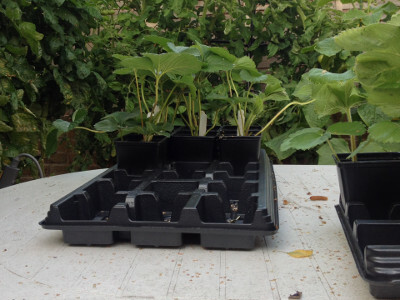 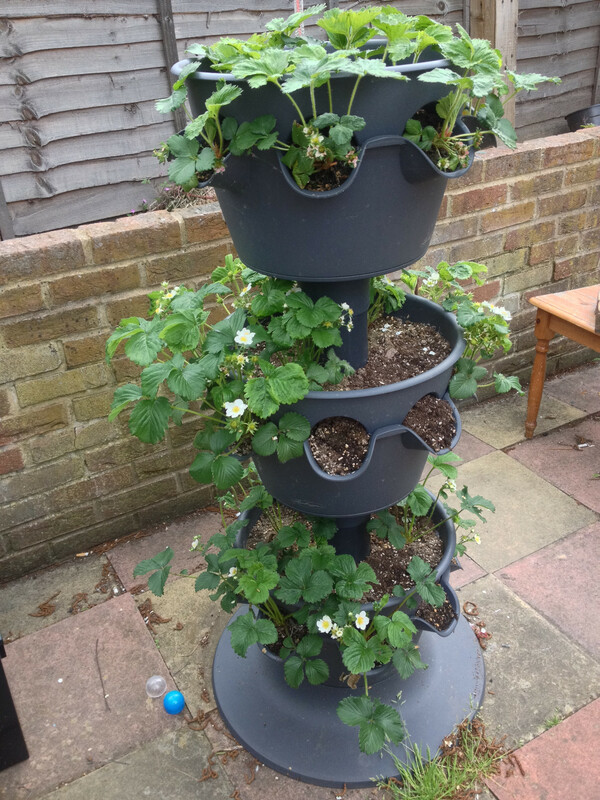 3-tier planter with strawberry plants developing in all 3 tiers. 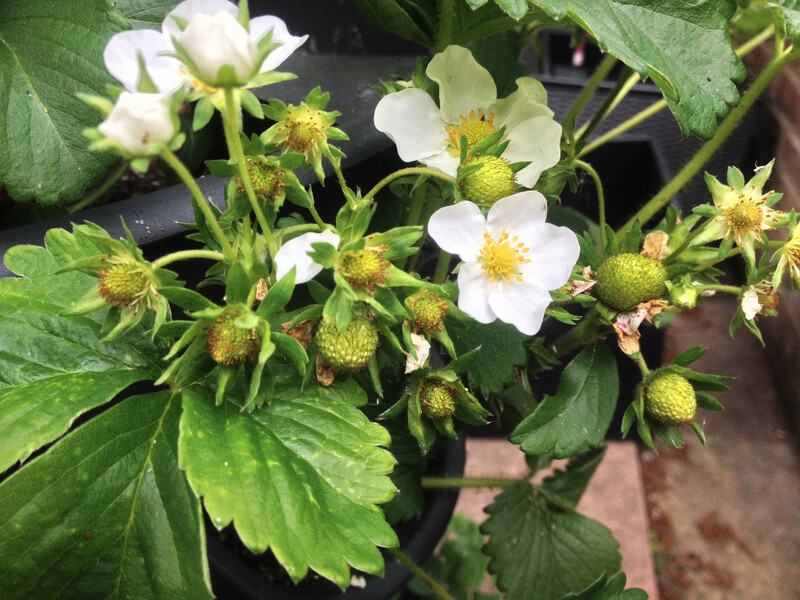 A couple of pollinated Flamenco strawberry flowers and a couple of developing Flamenco strawberries. Some developing Flamenco strawberries including one that has started to ripen. 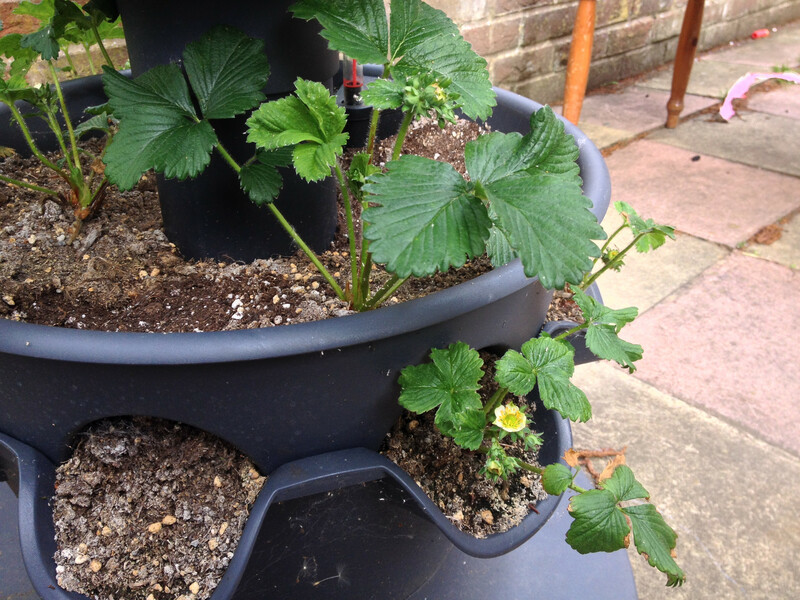 Cambridge Favourite strawberry plant with a flower and some developing fruit. Cambridge Favourite strawberry plants with closed flower buds, pollinated flowers, developing fruit, and runners/stolons. Cambridge Favourite strawberry plant with pollinated flowers, developing fruit, and runners/stolons. 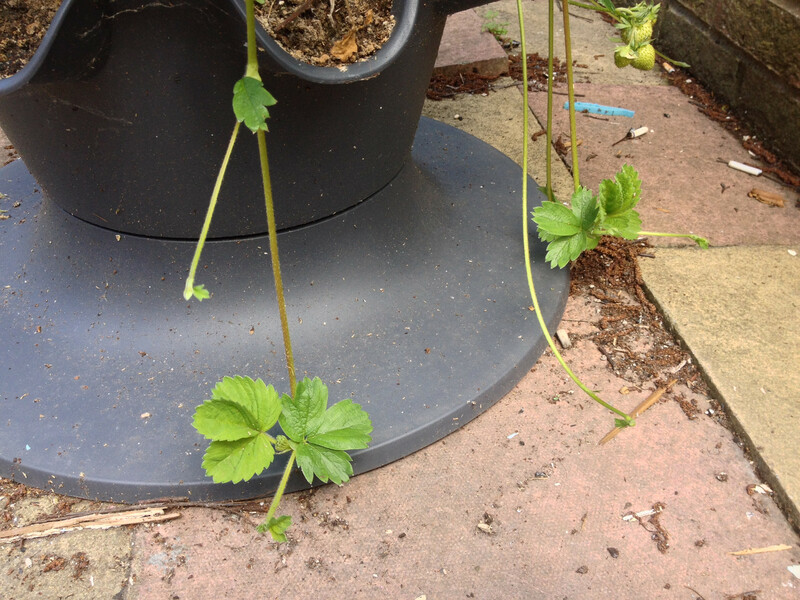 3 runners/stolons from Cambridge Favourite strawberry plants reaching down to the ground. 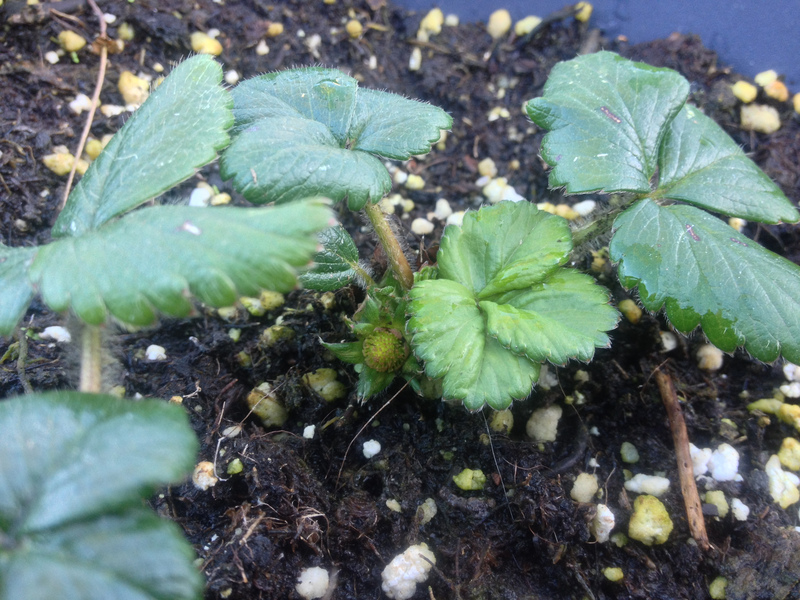 Florence strawberry plants with developing fruit. 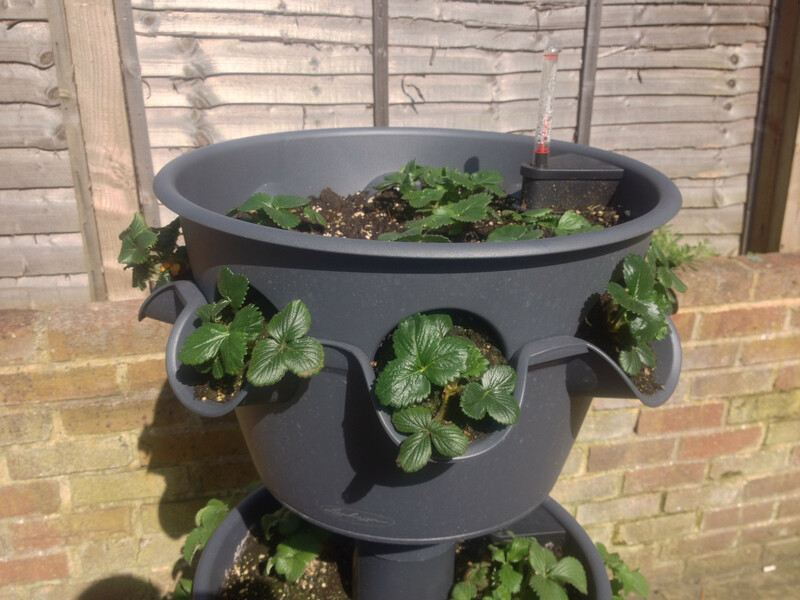 Top tier planter with fruiting Flamenco strawberry plants. 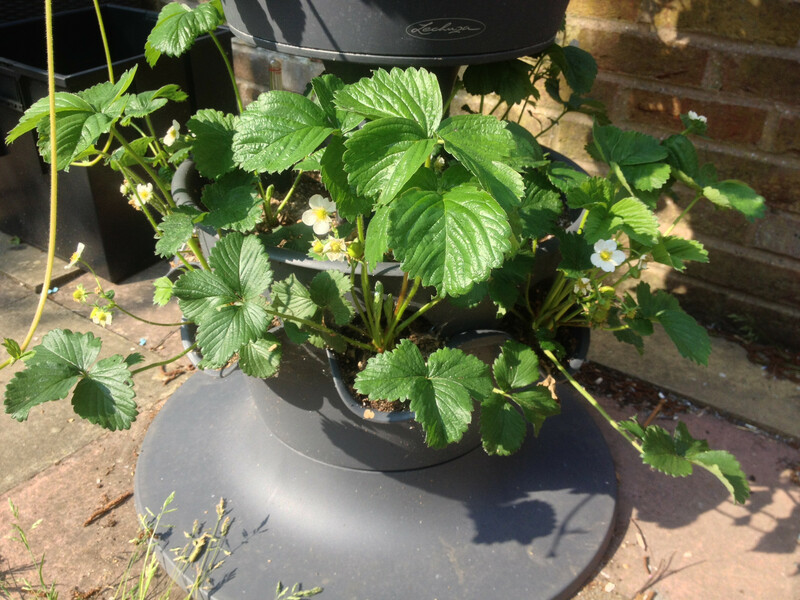 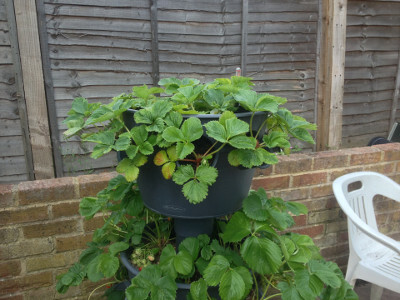 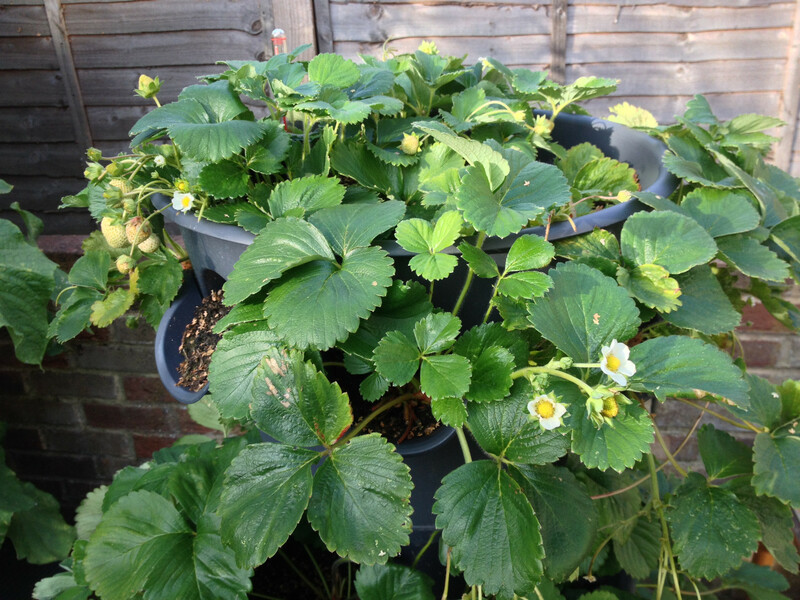 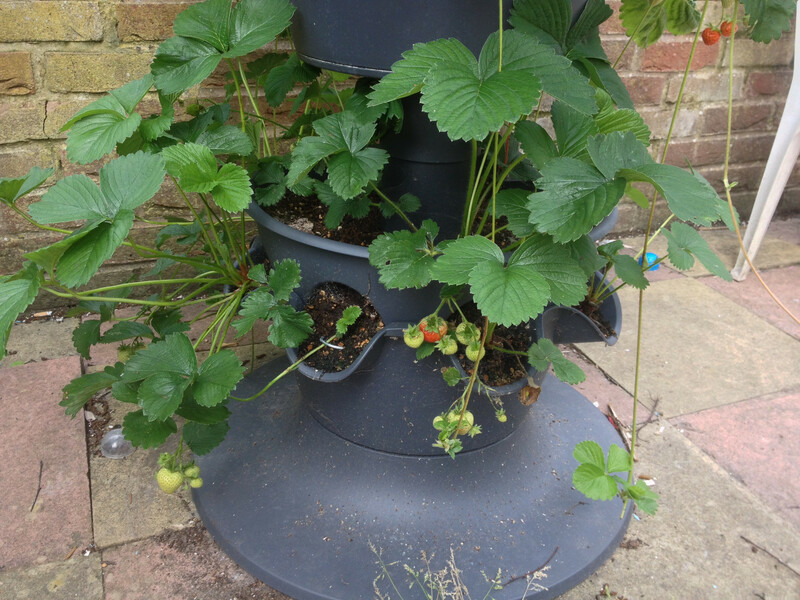 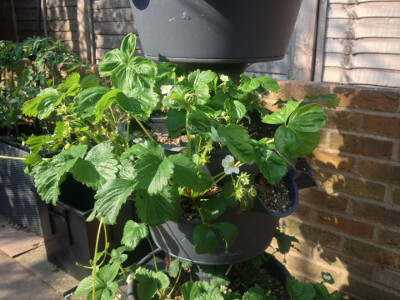 Middle tier planter with flowering and fruiting Cambridge Favourite strawberry plants. 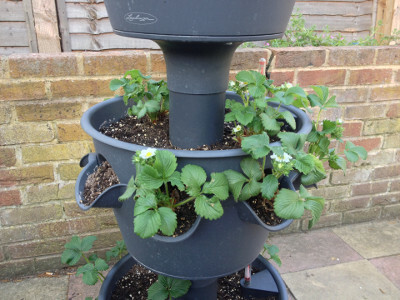 Bottom tier planter with flowering and fruiting Florence strawberry plants. 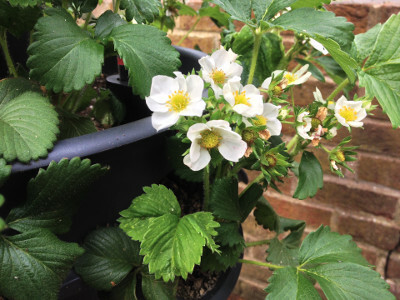 Cambridge Favourite strawberry plants with closed flower buds, flowers, pollinated flowers, developing fruit, and developing runners/stolons. 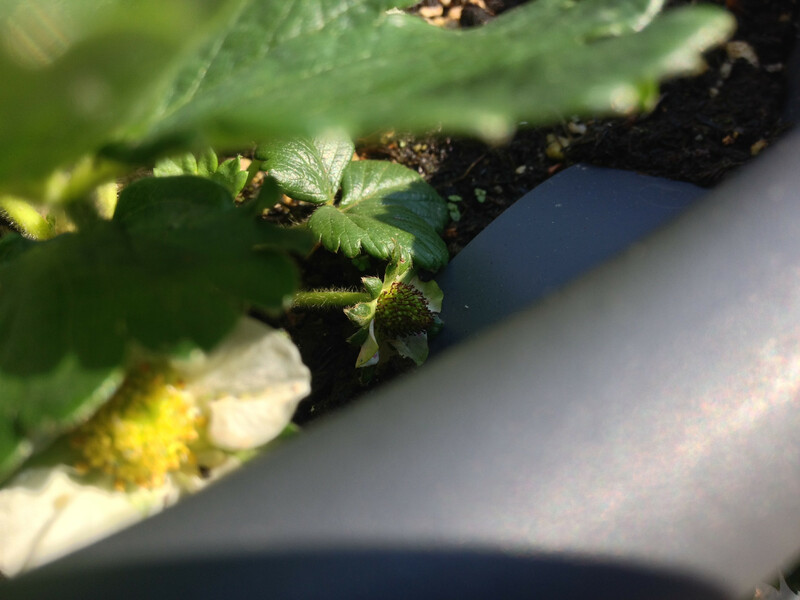 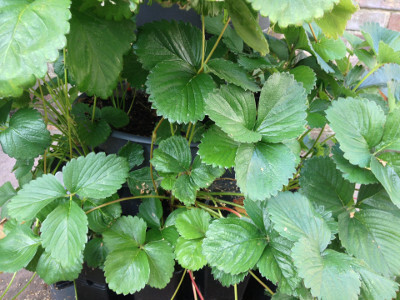 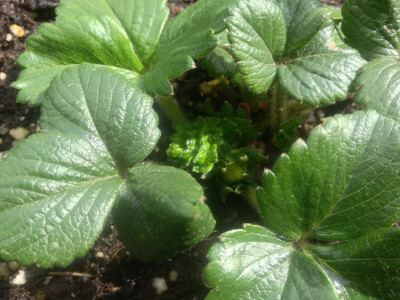 Cambridge Favourite strawberry plants with closed flower buds, flowers, pollinated flowers, and developing fruit. 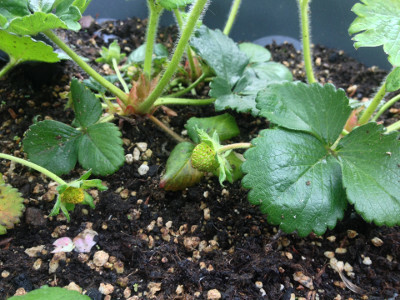 Florence strawberry plants with developing flower buds, flowers, pollinated flowers, and developing fruit. 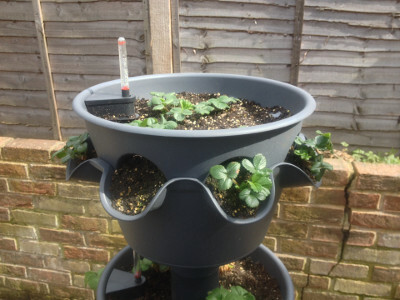 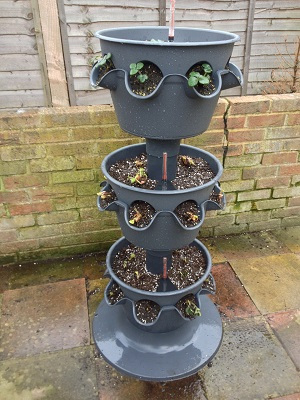 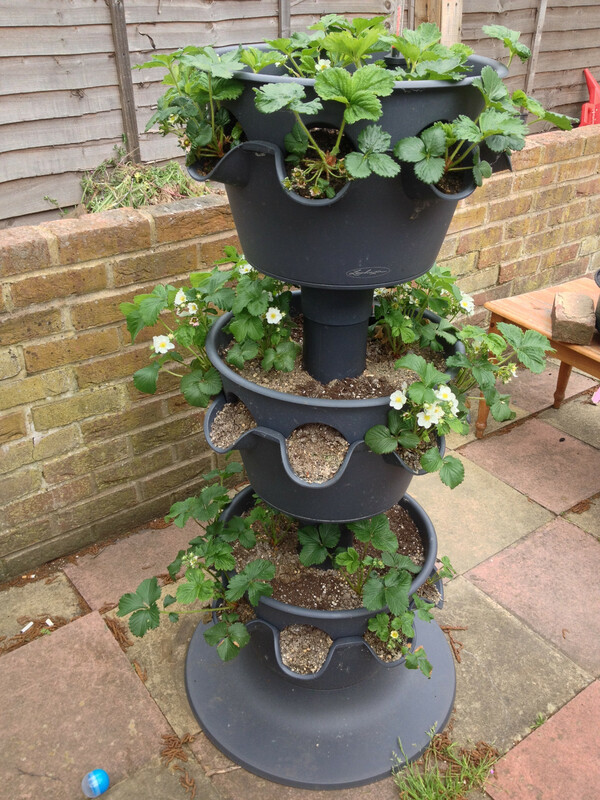 3-tier planter with strawberry plants flowering in all 3 tiers. Top tier planter with flowering and fruiting Flamenco strawberry plants. Bottom tier planter with flowering Florence strawberry plants. 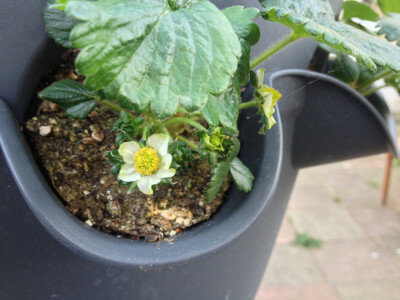 A pollinated Flamenco strawberry flower and a developing Flamenco strawberry. Cambridge Favourite strawberry plant with closed flower buds, flowers, pollinated flowers, developing fruit, and a developing runner/stolon. 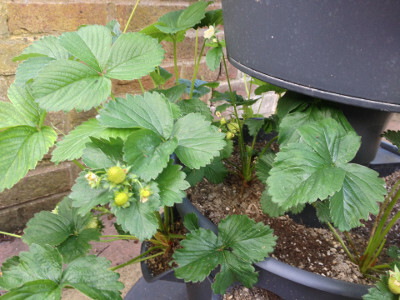 Cambridge Favourite strawberry plant with developing fruit. 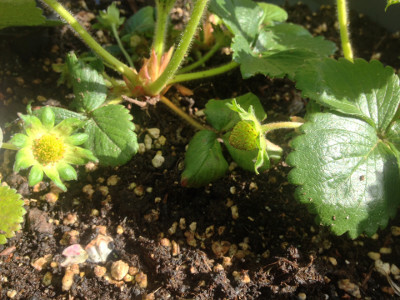 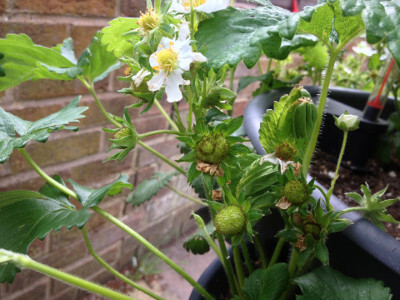 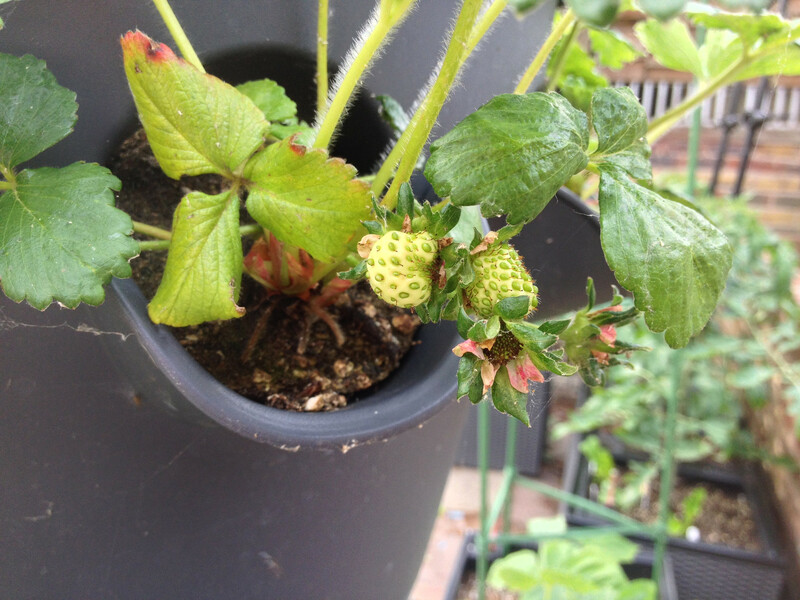 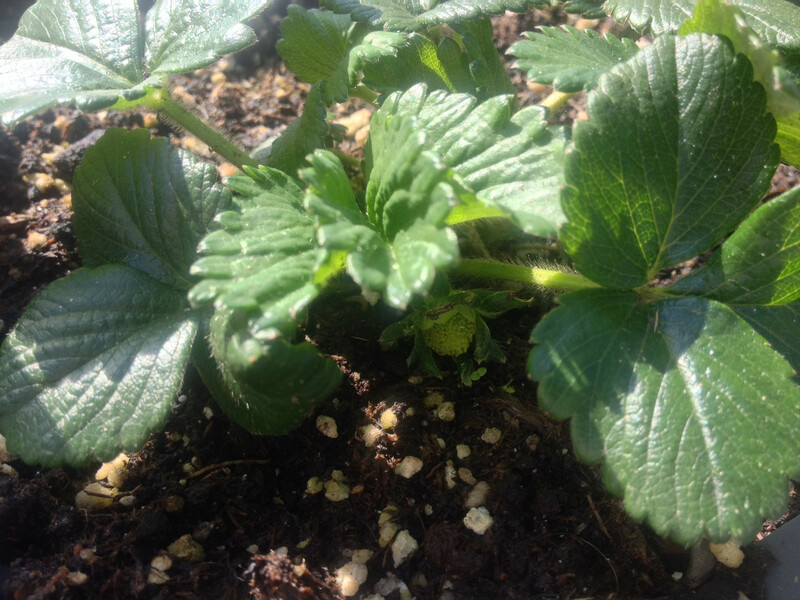 Cambridge Favourite strawberry plant with closed flower buds, flowers, pollinated flowers, and developing fruit. 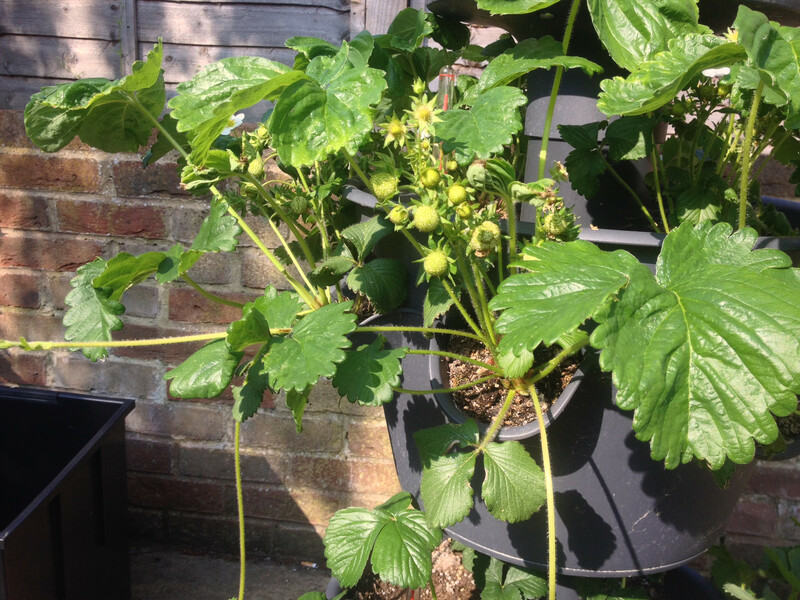 Cambridge Favourite strawberry plant with developing buds, closed flower buds, flowers, pollinated flowers, and developing fruit. 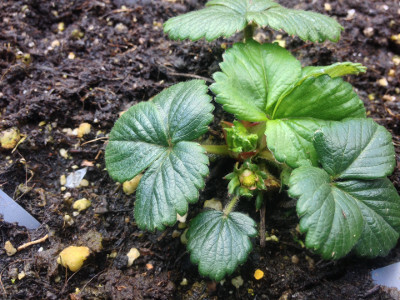 Budding and flowering Florence strawberry plants. 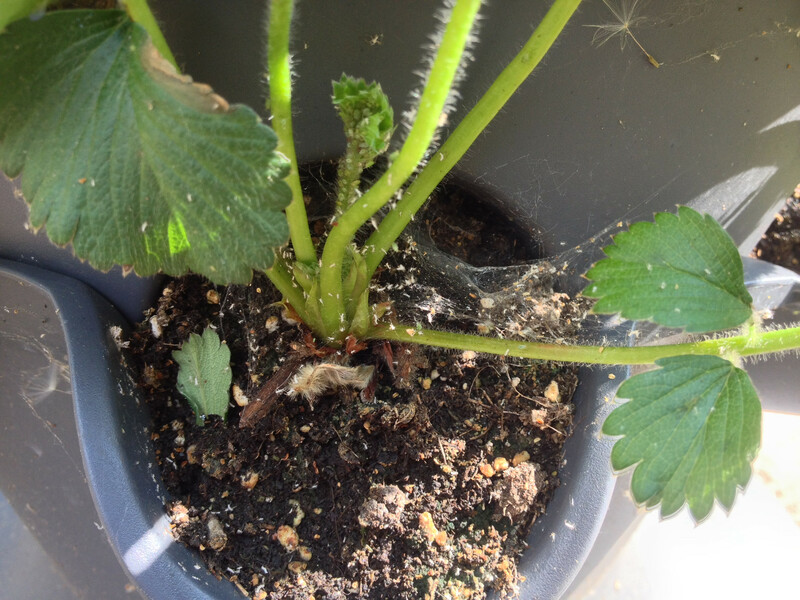 The aphids and tiny white insects are slowly being eaten by ladybirds and spiders. 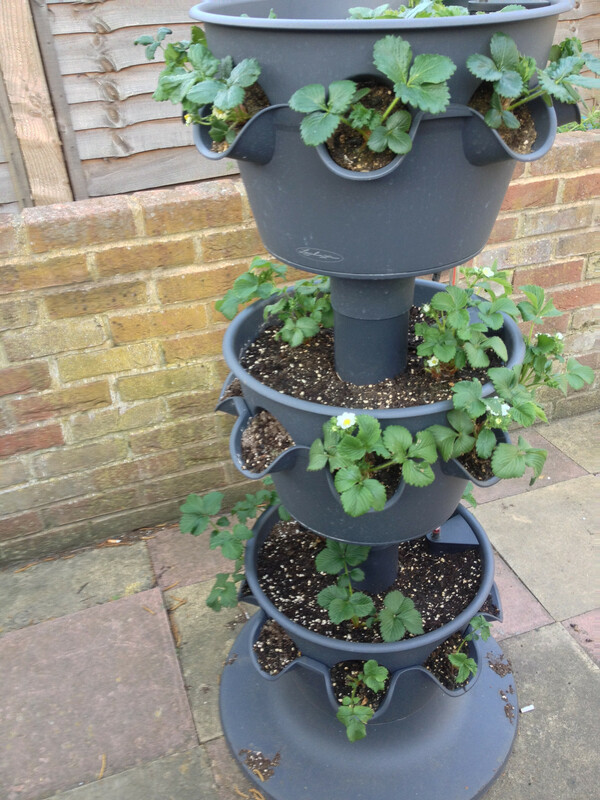 3-tier planter with strawberry plants flowering in top 2 tiers and flower buds in bottom tier. 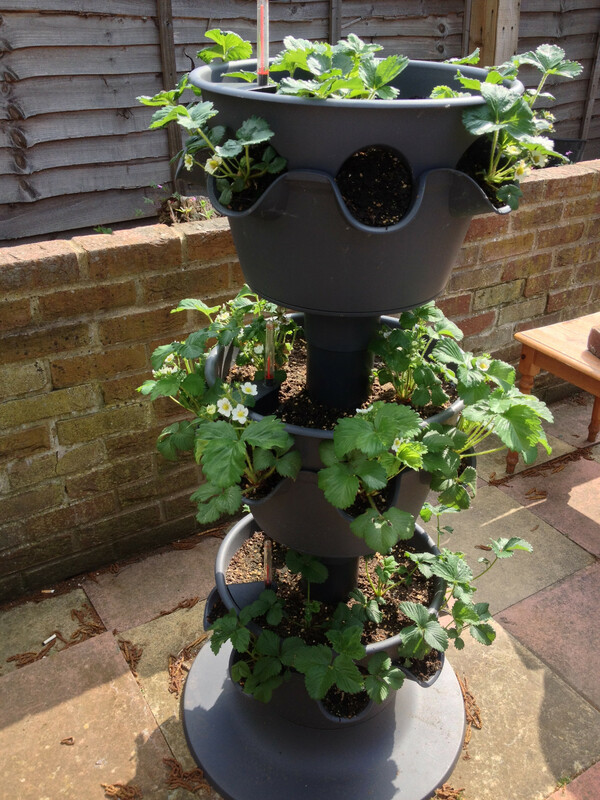 Middle tier planter with flowering Cambridge Favourite strawberry plants. 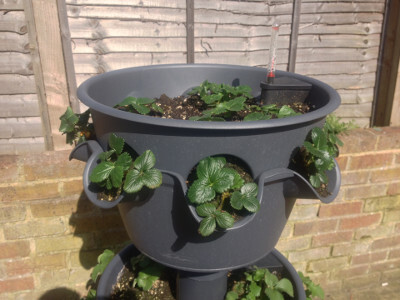 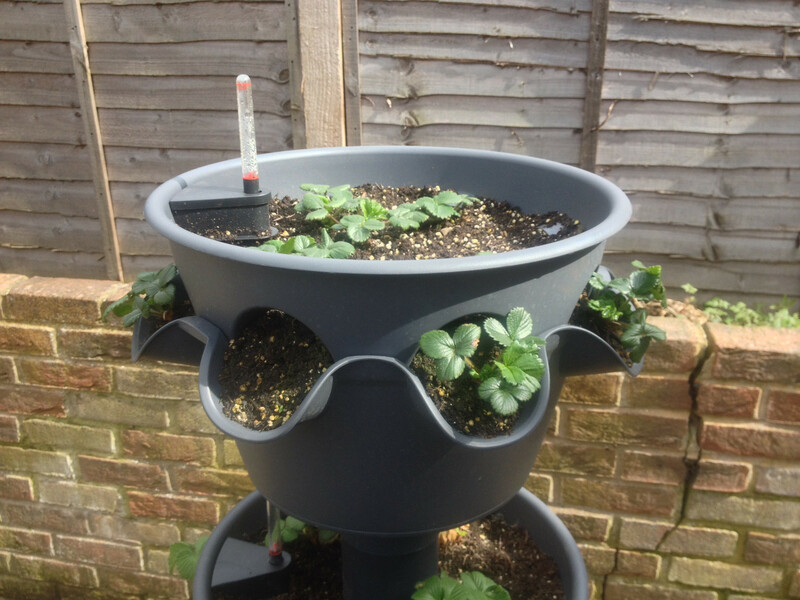 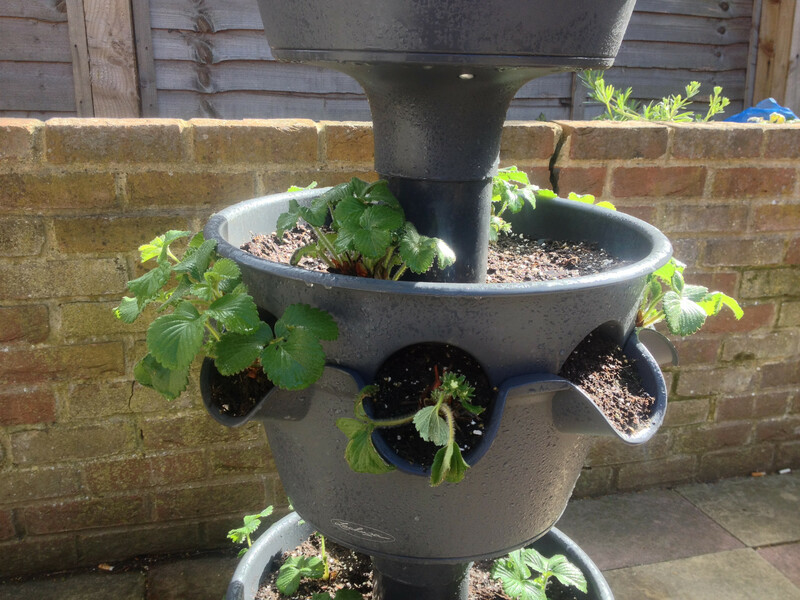 Bottom tier planter with budding Florence strawberry plants. Florence strawberry plant with some flower buds. Some aphids on a developing Florence strawberry plant leaf, and some tiny white insects (some of which have got caught in a spider web). 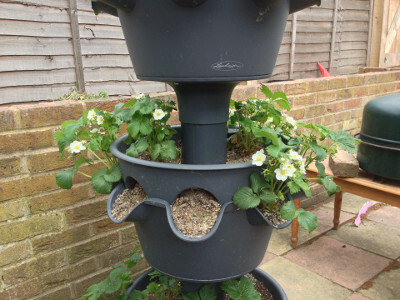 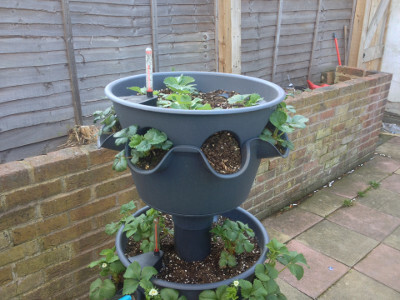 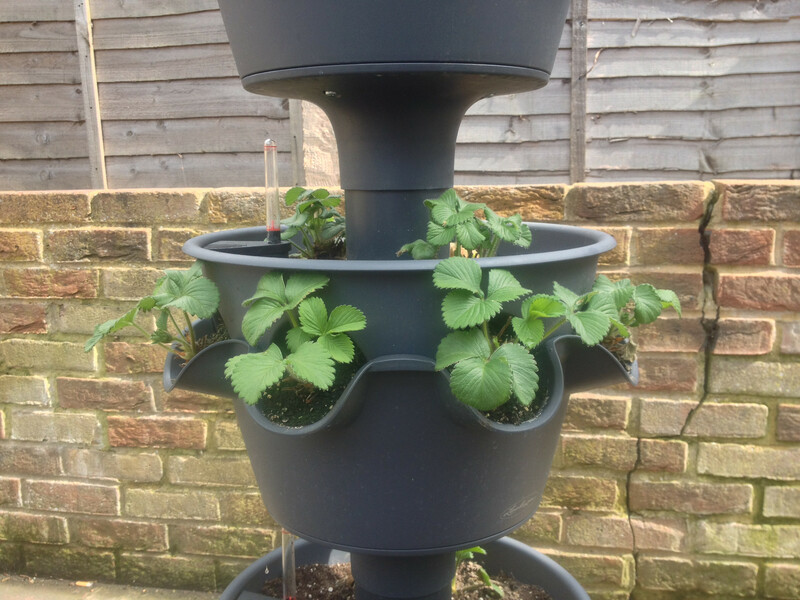 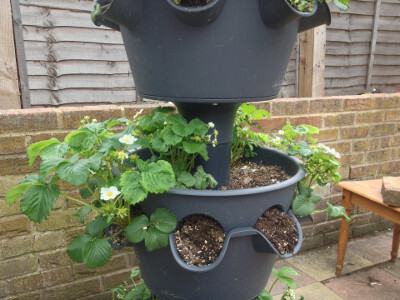 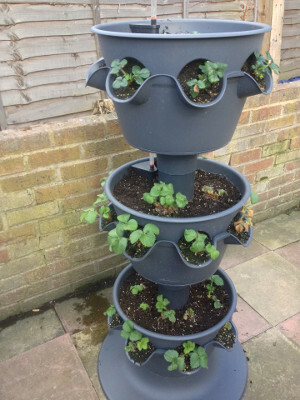 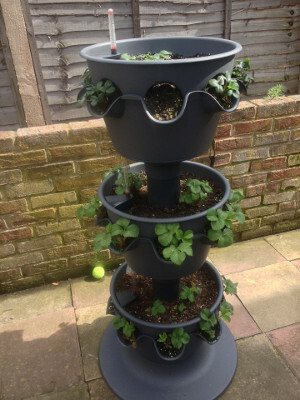 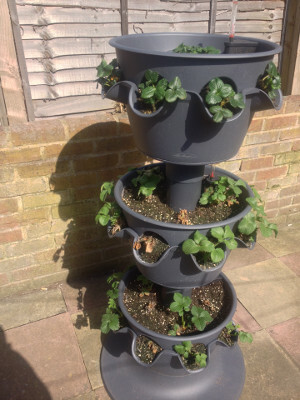 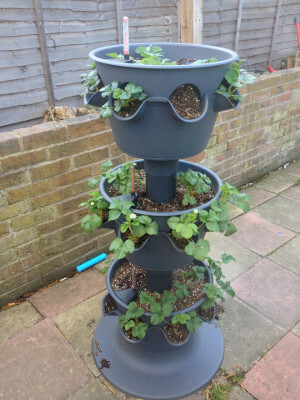 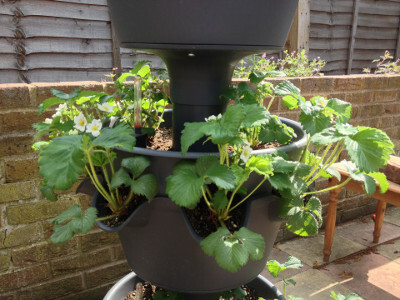 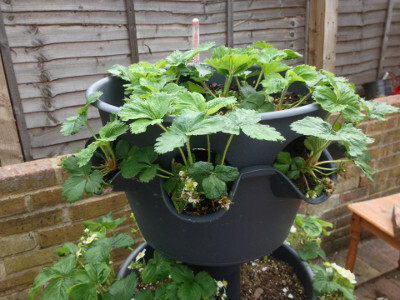 3-tier planter with strawberry plants flowering in top two tiers. 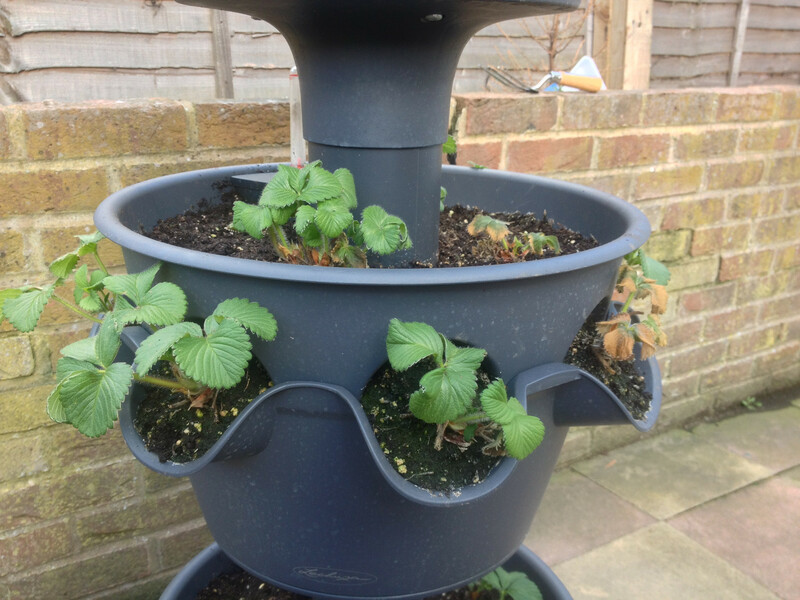 Top tier planter with flowering Flamenco strawberry flowers. Middle tier planter with flowering Cambridge Favourite strawberry flowers. Bottom tier planter with zero flower buds. 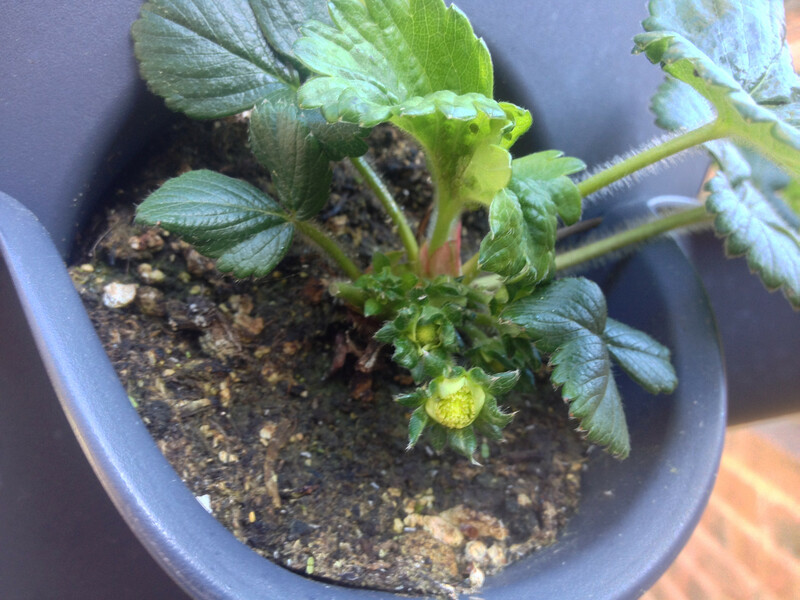 Two Flamenco strawberry flowers, two flower buds with petals visible, and a developing bud. 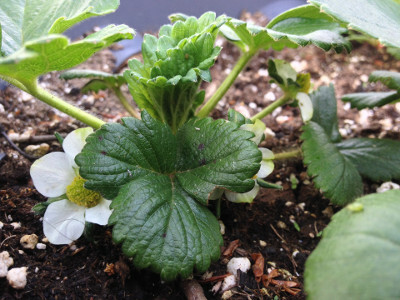 Three Flamenco strawberry flowers, hiding behind/under leaves. 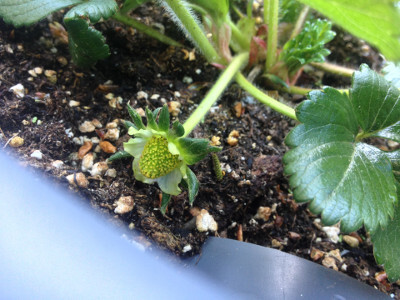 A partially pollinated strawberry flower. 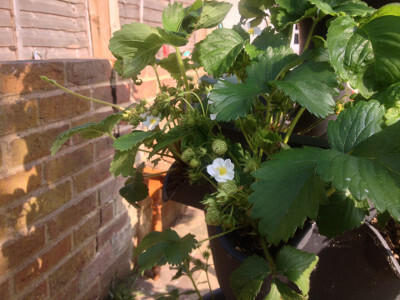 Cambridge Favourite strawberry plants with lots of flower buds and flowers. 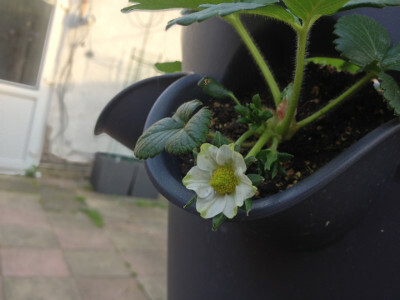 Middle tier planter with Cambridge Favourite strawberry flower buds close to opening. Flamenco strawberry flower and flower bud. 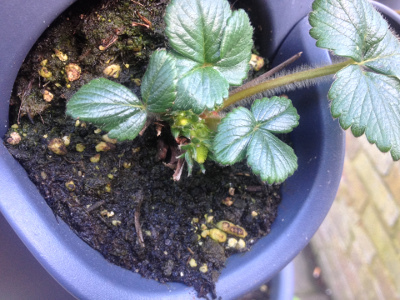 Flamenco strawberry flower, flower bud, and developing bud. Cambridge Favourite strawberry plant with lots of flower buds. Flamenco strawberry flower close to opening. 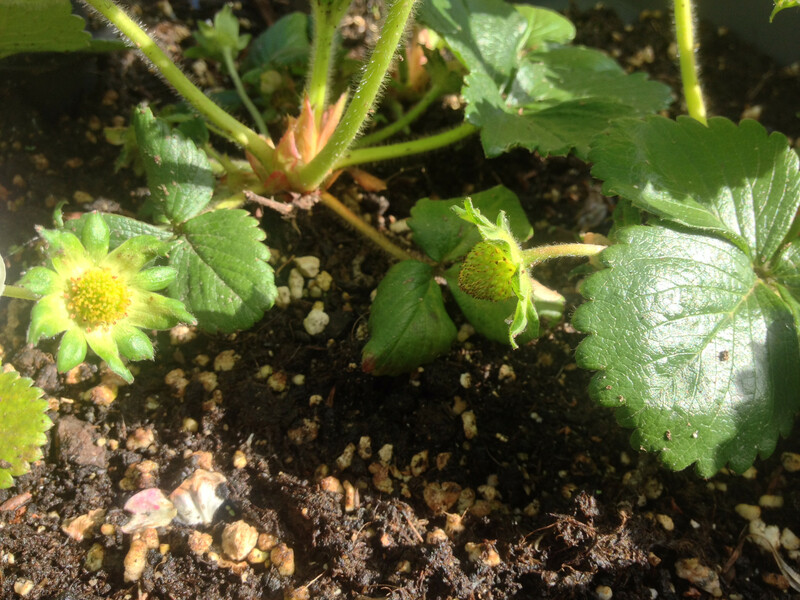 Flamenco strawberry flowers a few days away from opening. 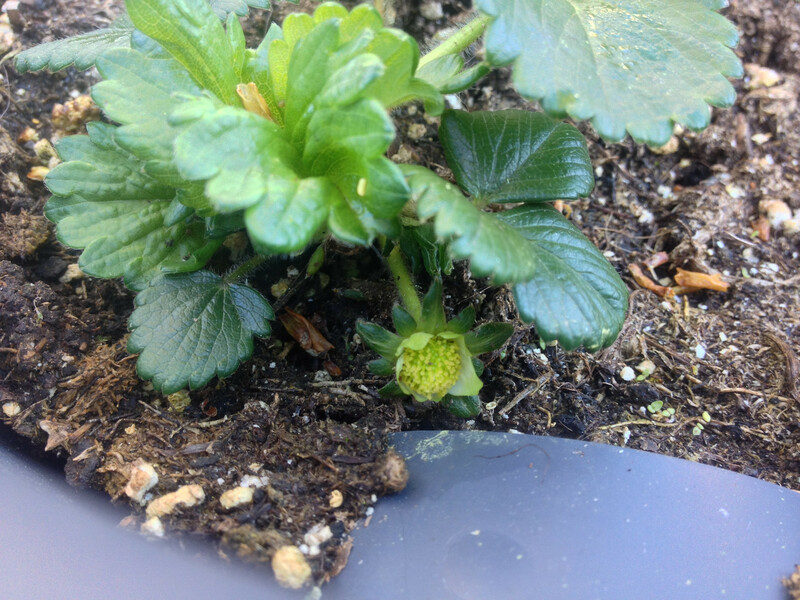 Flamenco strawberry flower a few days away from opening. 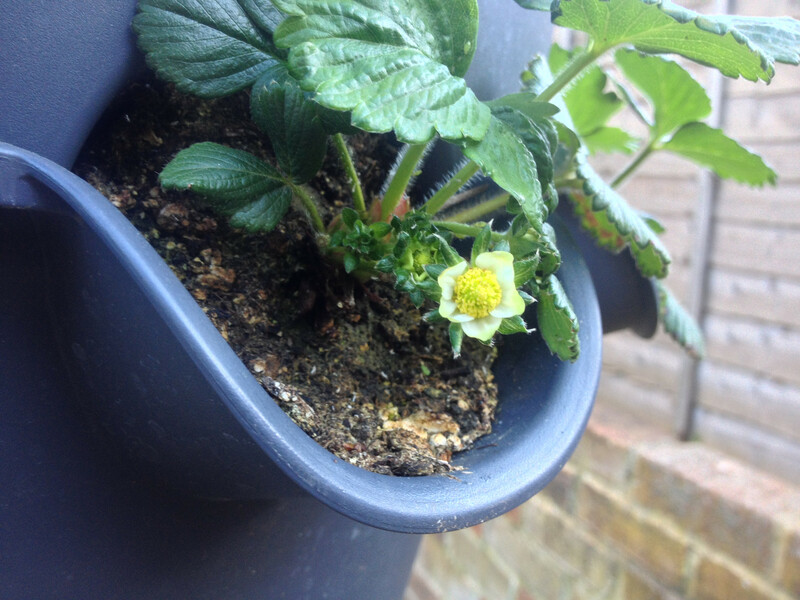 Closed Cambridge Favourite strawberry flower buds with petals visible. 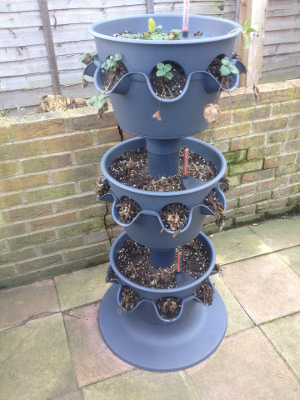 3-tier planter fed and watered, with weak/dead plants removed. Top tier with some flower buds close to opening. 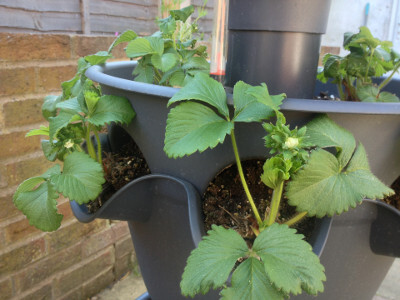 Remaining middle tier plants with flower buds developing, some nearing flowering stage. 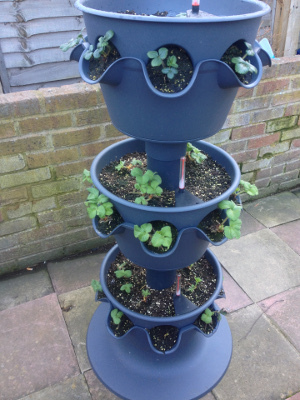 Remaining bottom tier plants slowly putting on leaf growth. 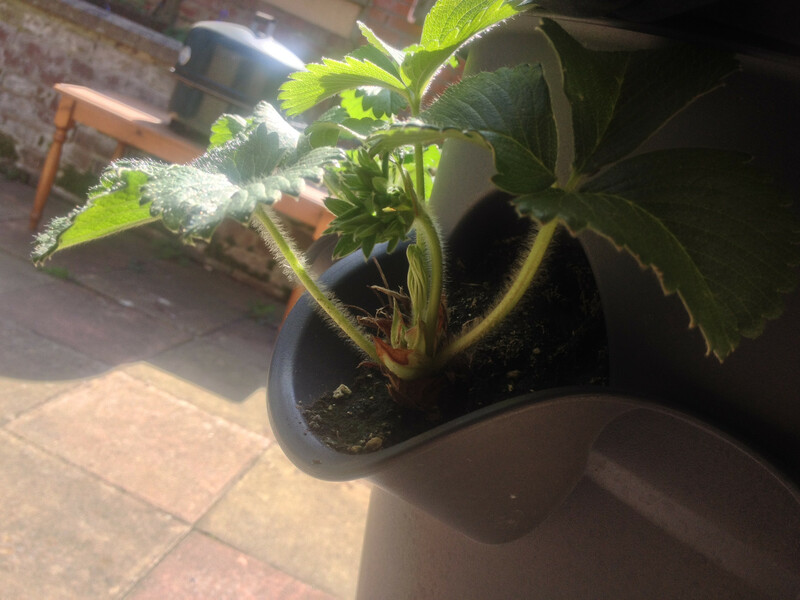 This wilted plant obviously doesn't have deep roots. Hopefully it will recover and flower. 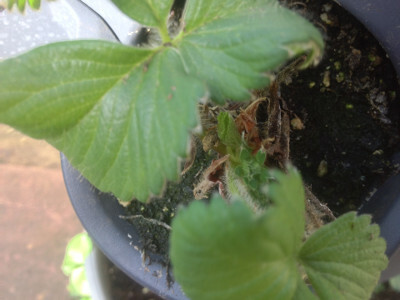 Two old unpollinated flowers (left centre), a flower bud (centre bottom), and some developing flower buds (hidden by lower leaf). 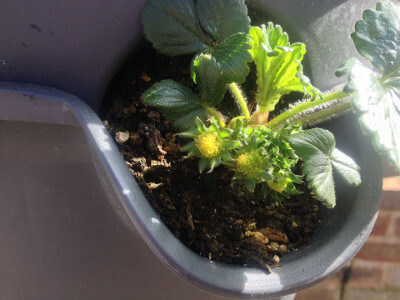 A flower bud in top tier. 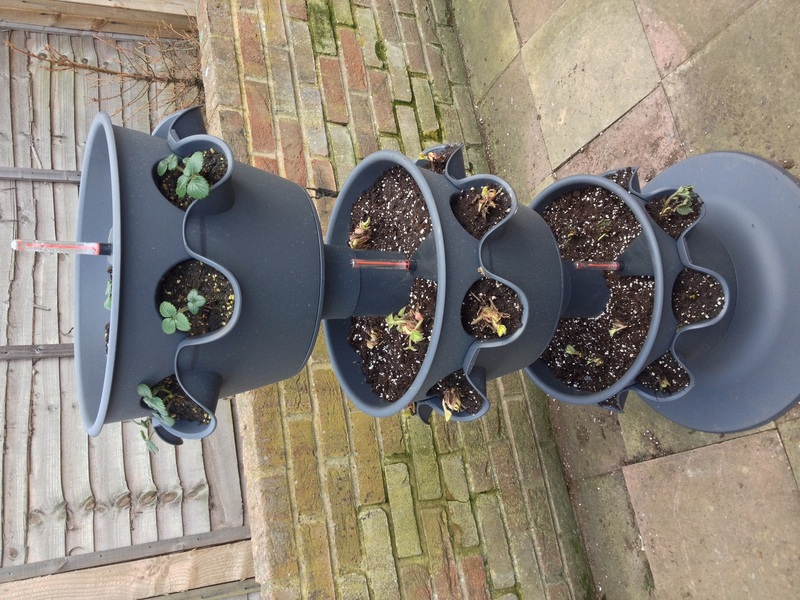 3-tier planter with some weak plants in middle and bottom tiers dying off. 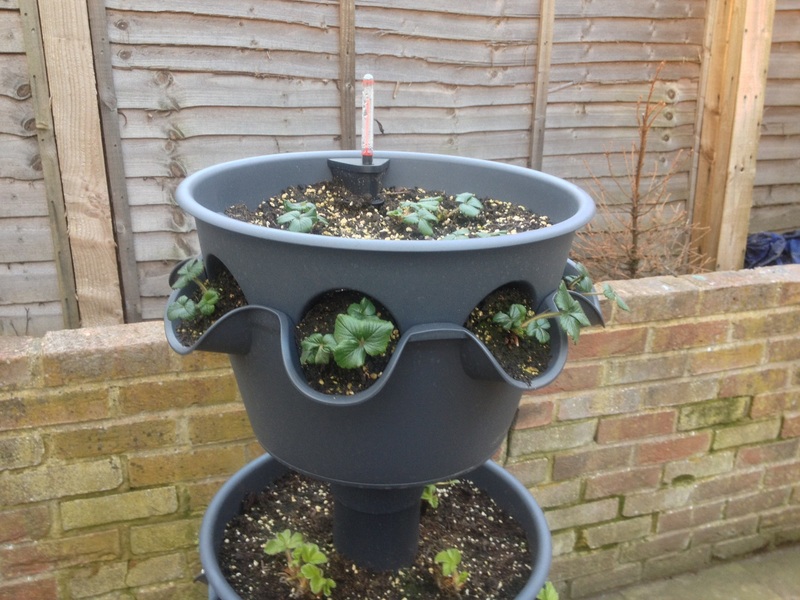 Top tier still wet. 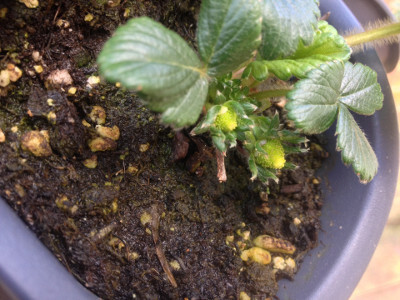 More leaf growth and some flower buds forming. 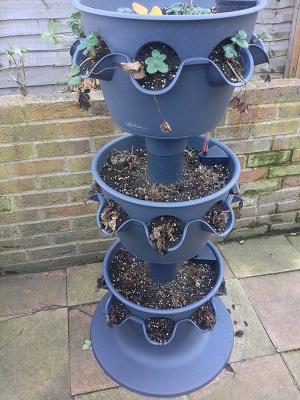 Some weak plants in middle tier dying off. Most surviving plants have flower buds. 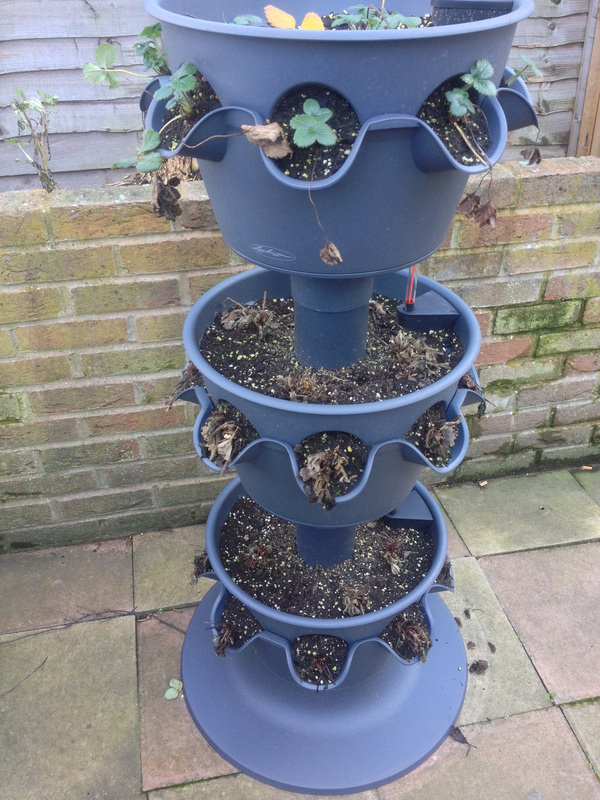 Some weak plants in bottom tier dying off. 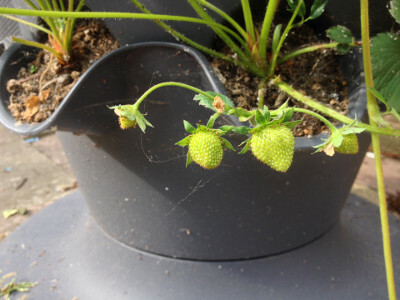 A flower bud (centre right) in top tier. A flower bud in top tier close to opening (centre) underneath an old unpollinated flower. Some developing flower buds in middle tier. 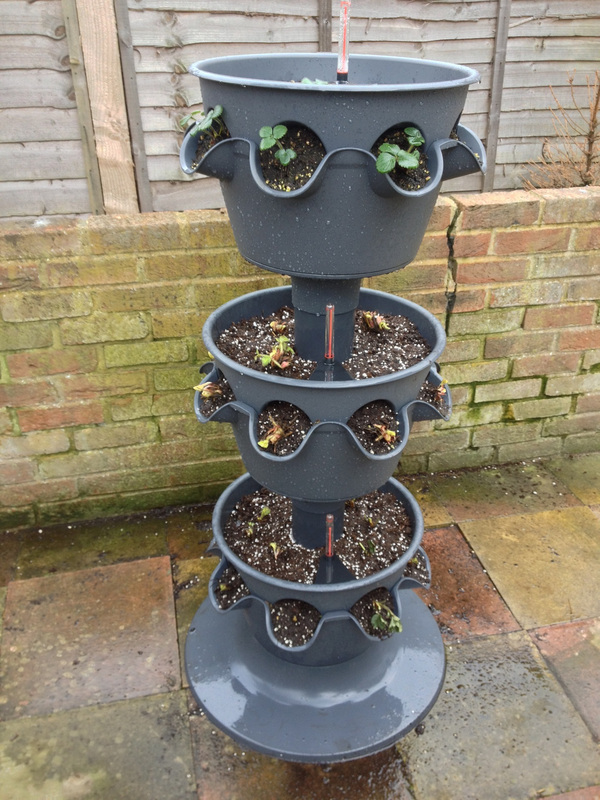 3-tier planter slowly drying out. 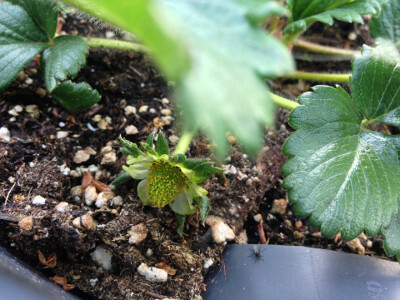 The bottom two tiers will soon get a heavy watering to deal with any salt buildup. Top tier is putting on growth, but the leaves' stems are short making the leaves look crowded and the plants flat. 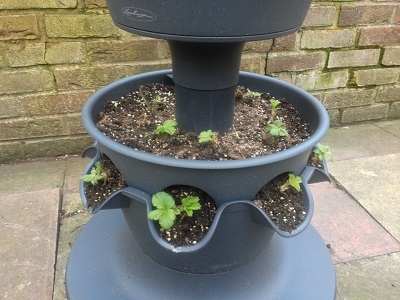 Middle tier is putting on growth with some buds visible (no flowers yet). 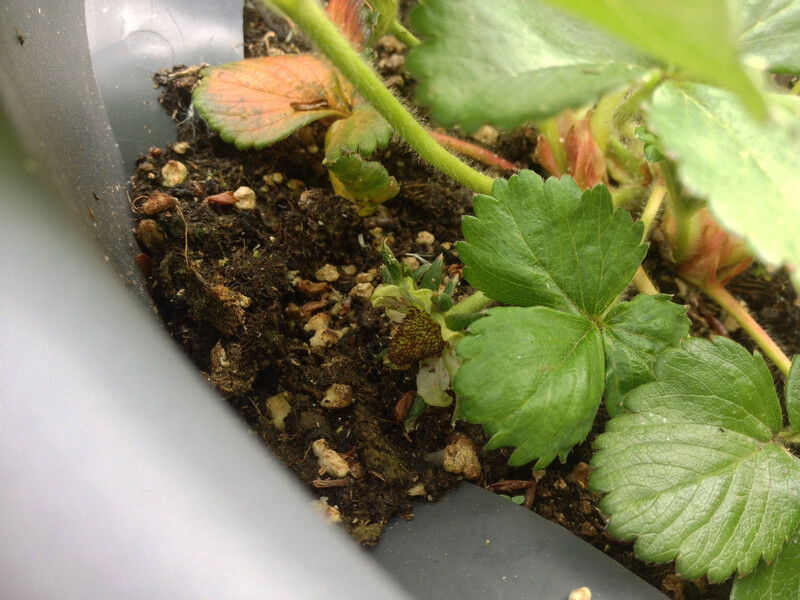 A few plants don't look that good, but might survive. The plants in the bottom tier are slowly growing, although a few look like they will die. 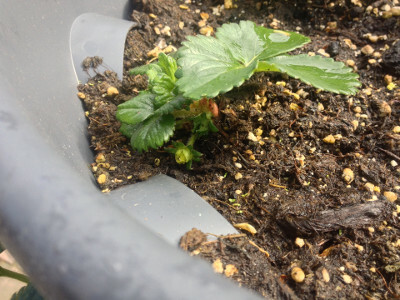 I hope most of them will survive. This Cambridge Favourite plant is the one I took a photo of last week. 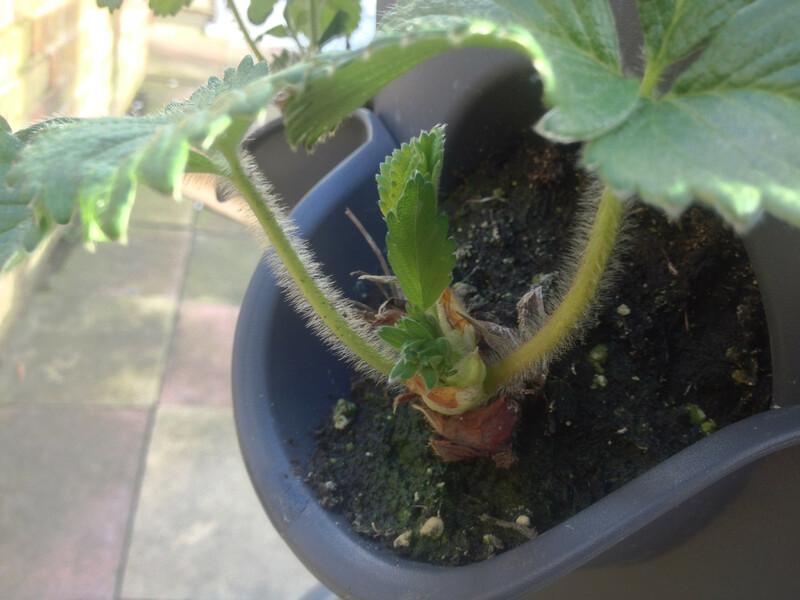 You can see the leaf has grown away from the crown and the flower bud's stem is getting longer. This Flamenco flower bud has its petals (and they are white) so it might become my first strawberry. 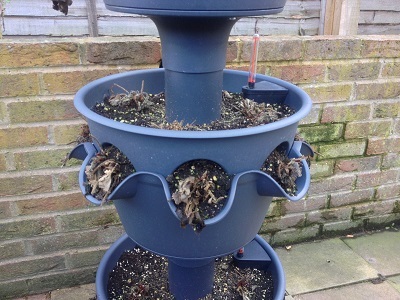 3-tier planter emptied of water as the plants were possibly too wet. 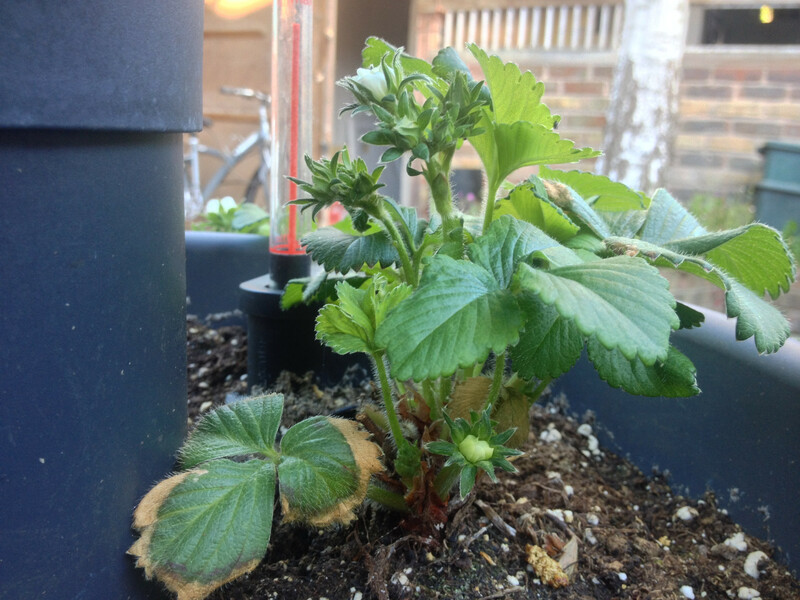 Top tier planter (Flamenco cultivar) looks healthy, with new growth and some flower buds. 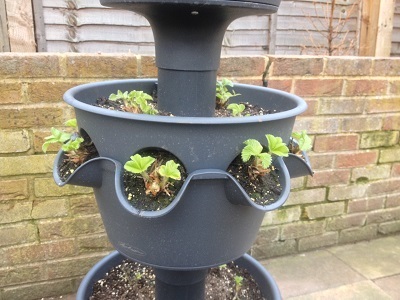 Middle tier planter (Cambridge Favourite cultivar) looks mostly healthy, with new growth on most plants and what I assume will be flower buds. 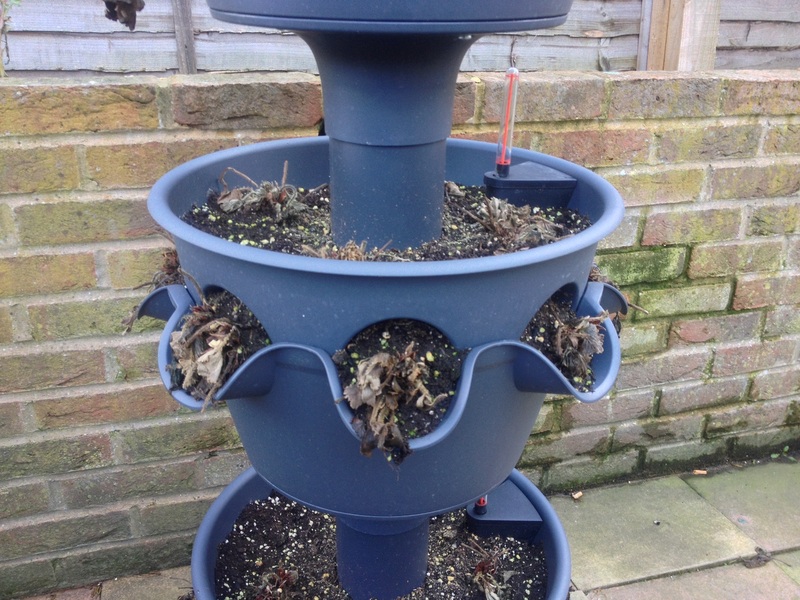 Bottom tier planter (Florence cultivar) looks a bit iffy with some plants starting to look like the dead ones did. These two flowers should have started looking more strawberry-like by now if they had been pollinated. 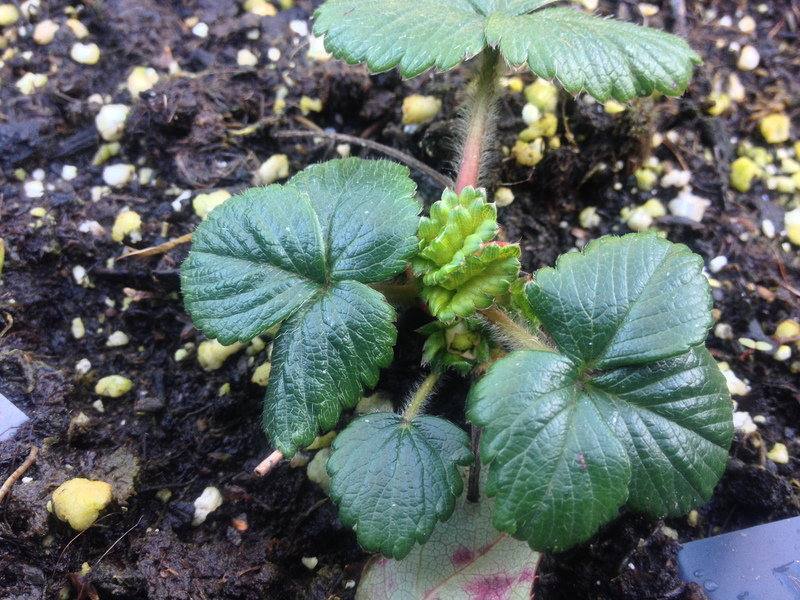 This plant has grown some more leaves in the last week. I don't think that flower will result in anything. Between the two leaves on this Cambridge Favourite plant you can make out a new leaf appearing (top centre) and what looks like a flower bud (bottom centre). Similar to the other image, here you can see a new leaf emerging top centre, and what looks like a flower bud bottom centre, on this Cambridge Favourite plant. 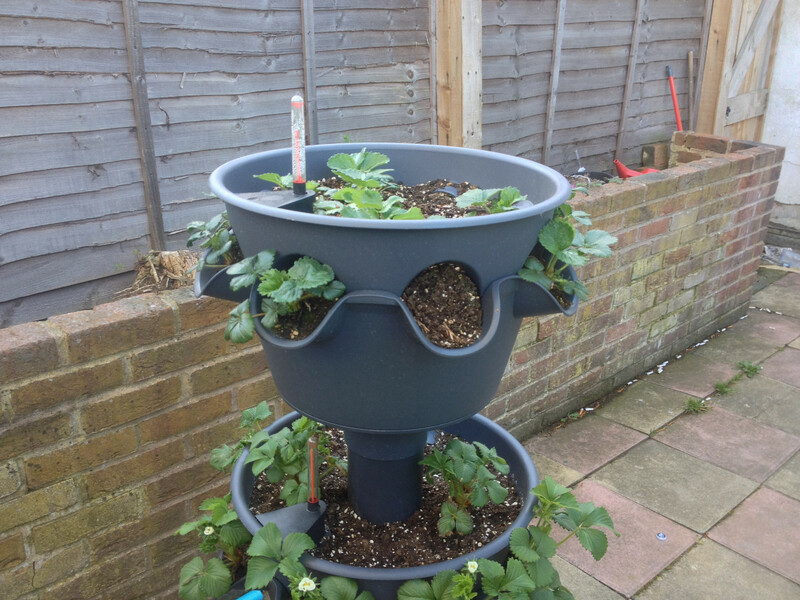 3-tier planter 4 weeks after replanting; Spring is here. Top tier plants starting to put out spring growth. 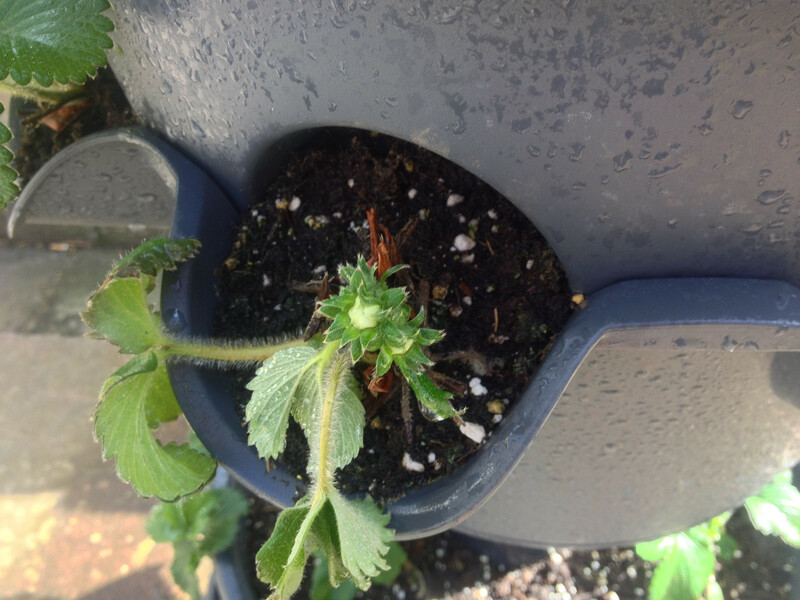 Middle tier plants are putting out some growth. 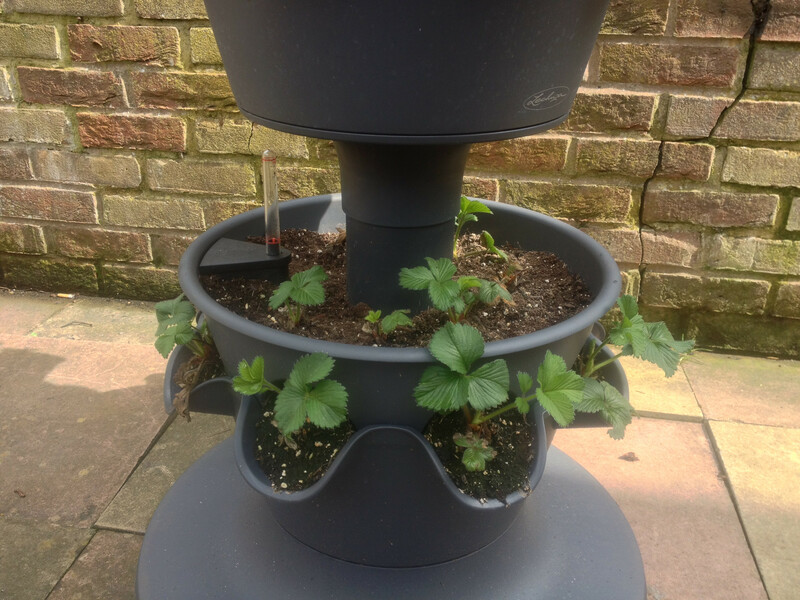 Bottom tier plants are slowly putting out growth, overcoming some cold damage. 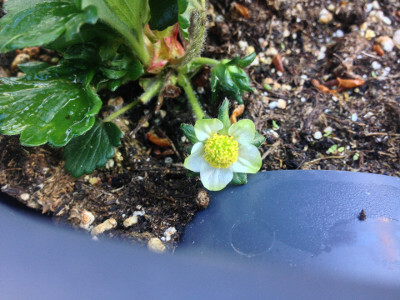 This strawberry flower was too close to crown to cut off, experienced several frosts. 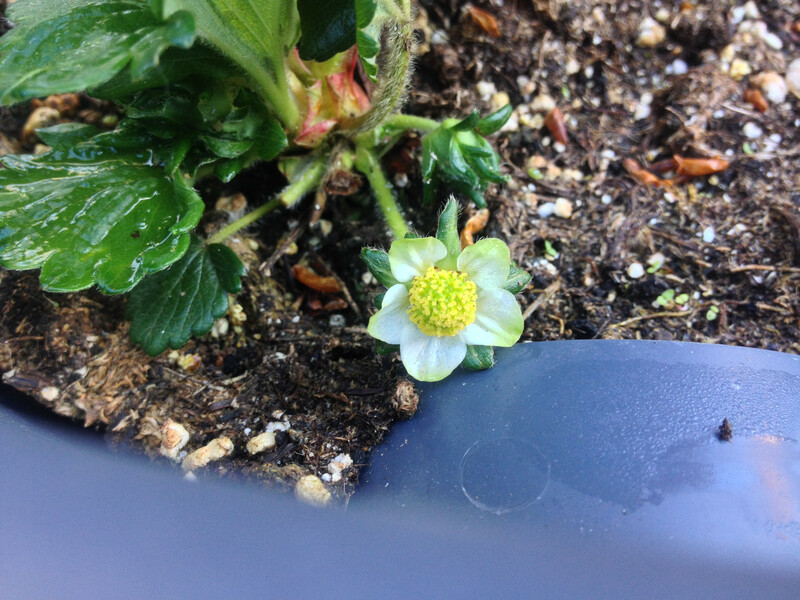 This might be the first strawberry flower to open with this Spring with petals. 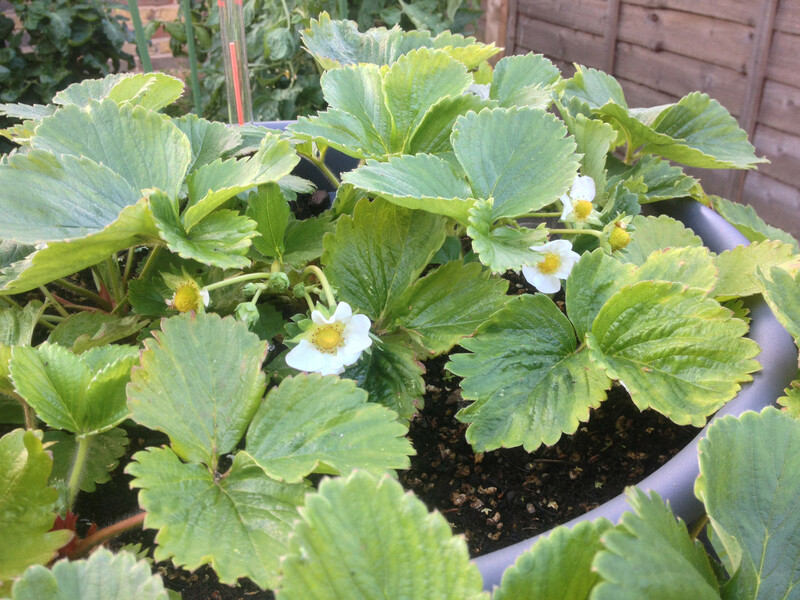 These strawberry flowers may or may not turn into strawberries having experienced some frost. 3-tier planter a fortnight after replanting. 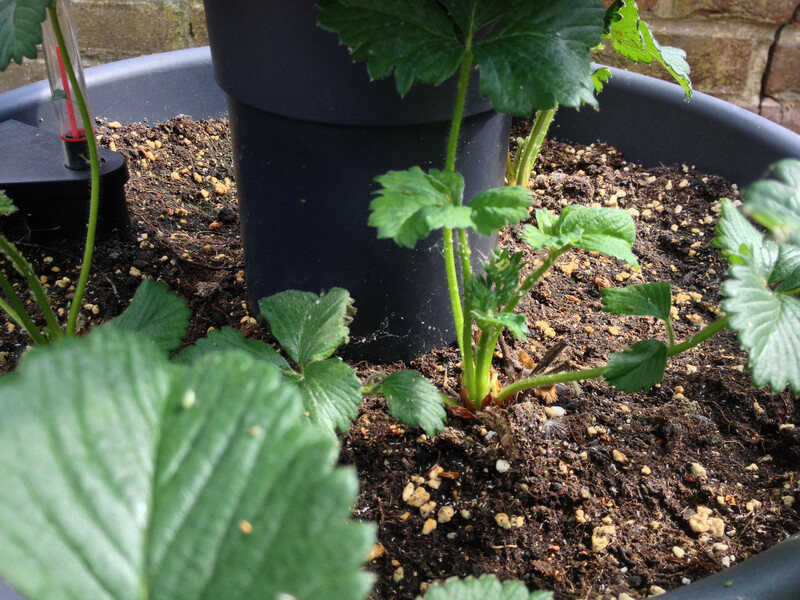 Top tier plants looking OK.
Middle tier showing some new growth. Bottom tier showing some growth. 3-tier planter 1 day after replanting. 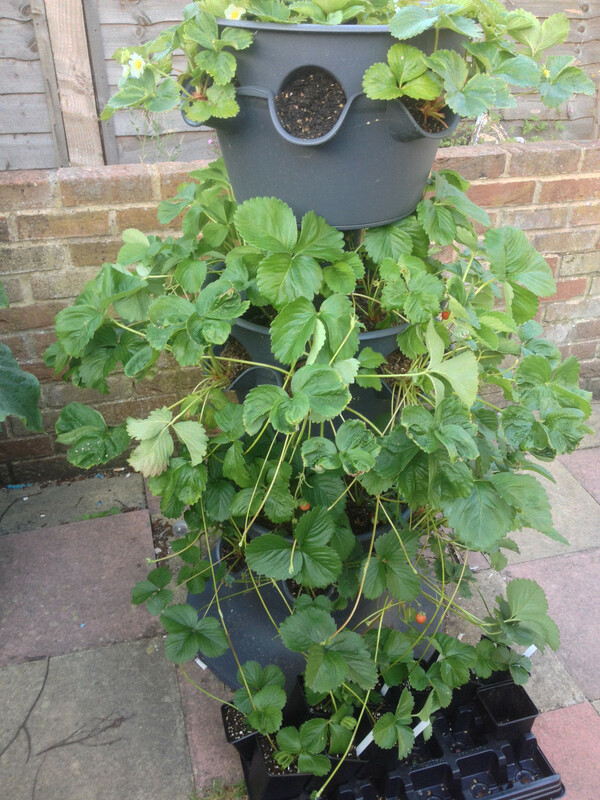 Middle tier 1 day after replanting. Bottom tier 1 day after replanting. 3-tier planter with two tiers replanted. 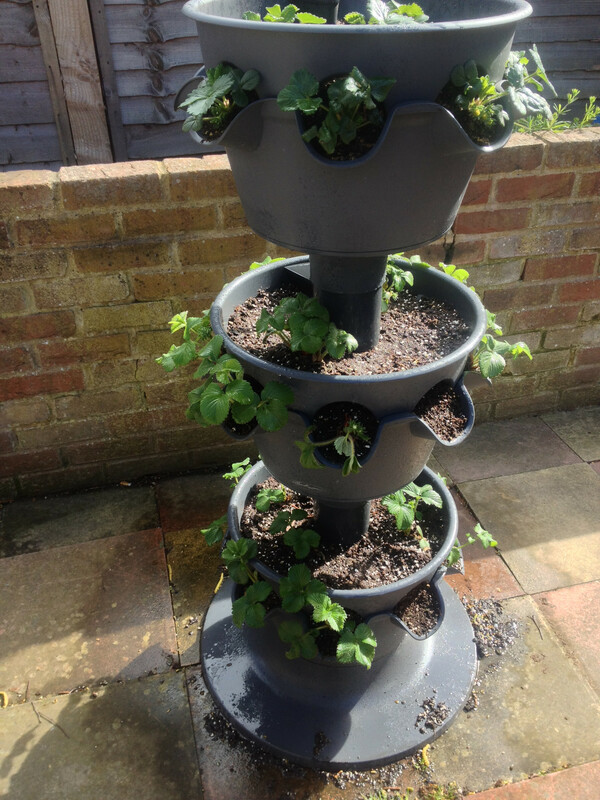 Middle tier with replacement plants. Bottom tier with replacement plants. 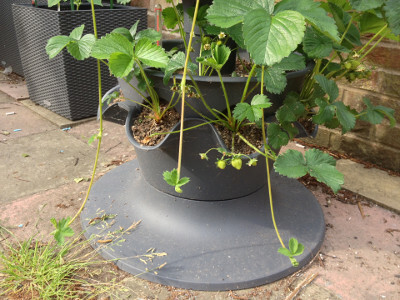 3-tier planter not looking that good. Top tier plants are still alive. Middle tier plants are dead. 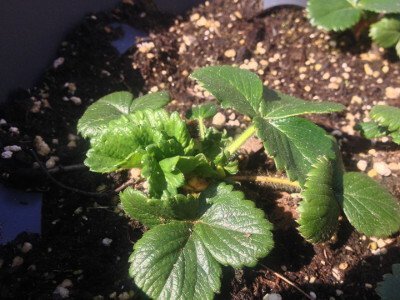 Bottom tier plants are dead. 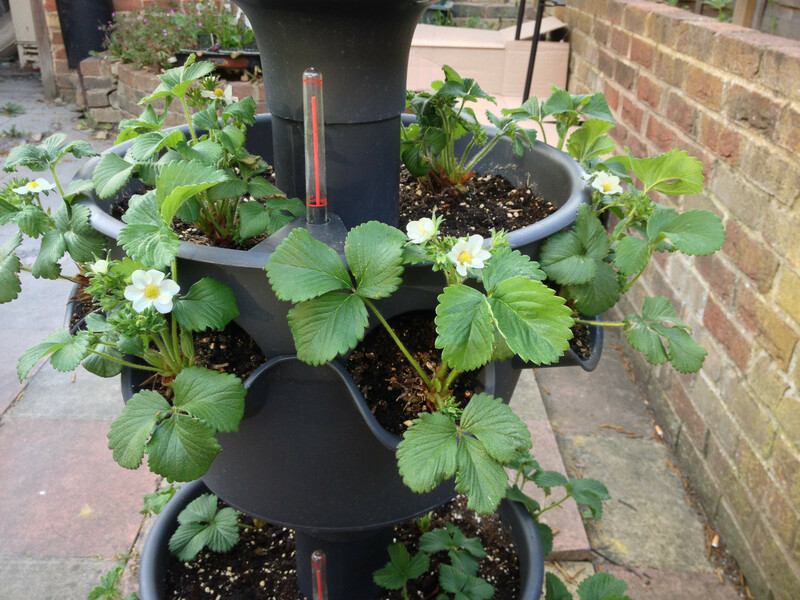 Top tier water level at maximum. 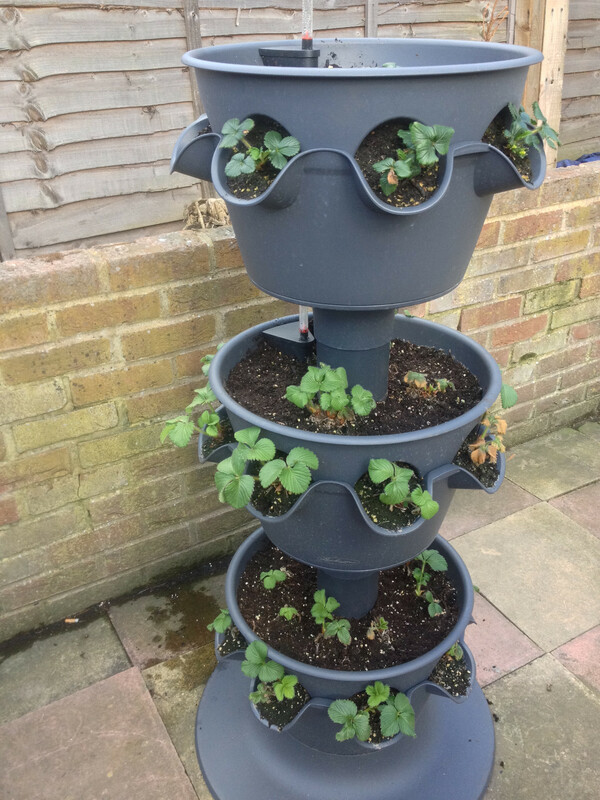 Middle tier water level at maximum. Bottom tier water level at maximum. 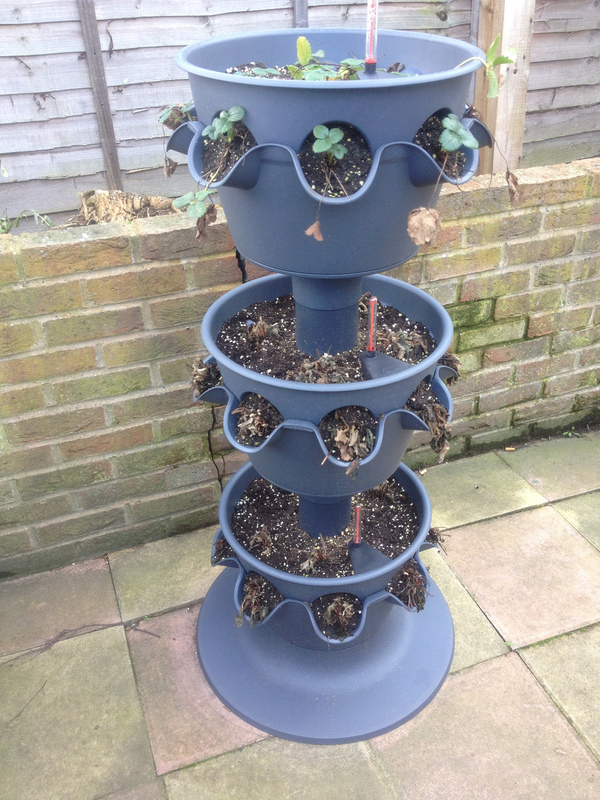 3-tier planter, some plants looking dead. 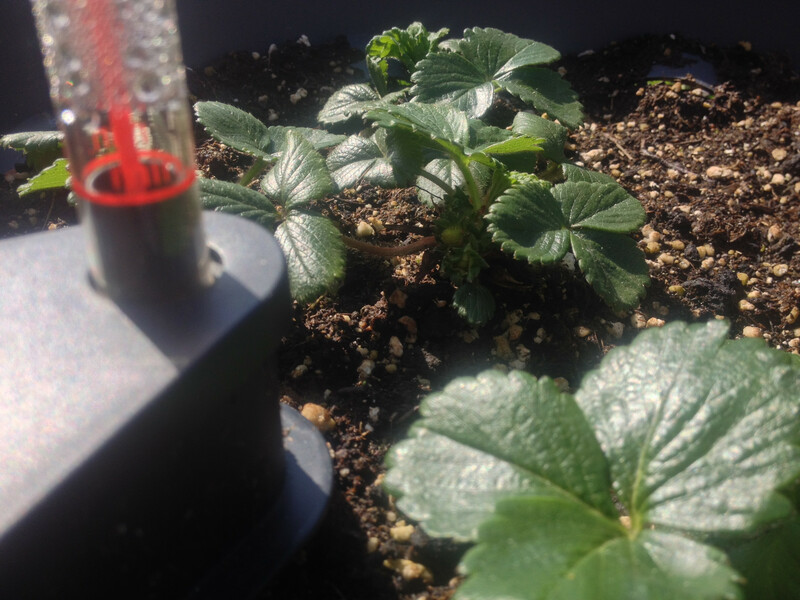 Top tier water level near maximum, plants looking fine. 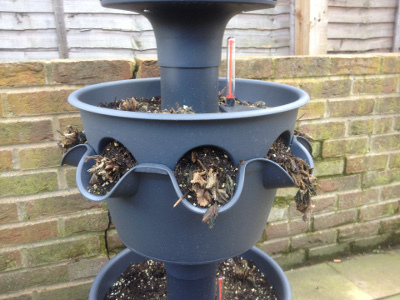 Middle tier water level at minimum, plants dying off. Bottom tier water level at minimum, plants dying off. 3-tier strawberry planter rotated back to first position. 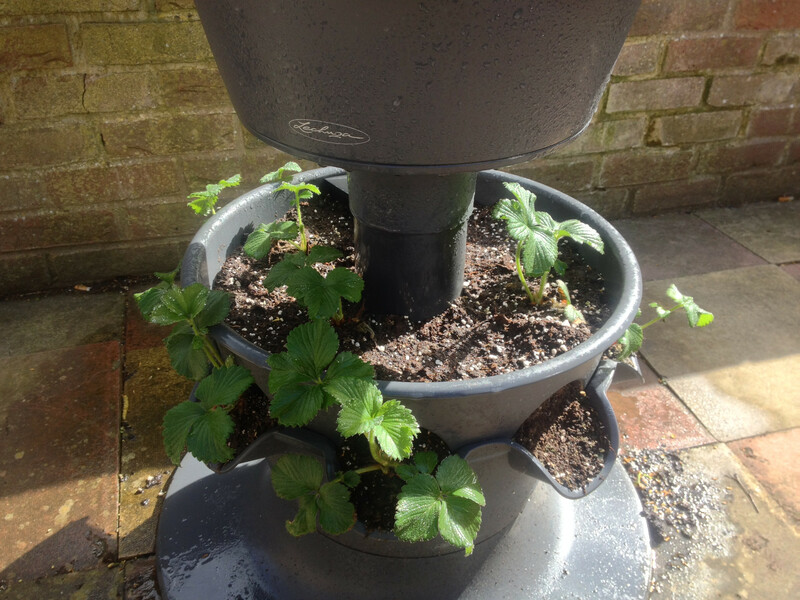 Most strawberry plants are looking OK.
Top tier water level near maximum. 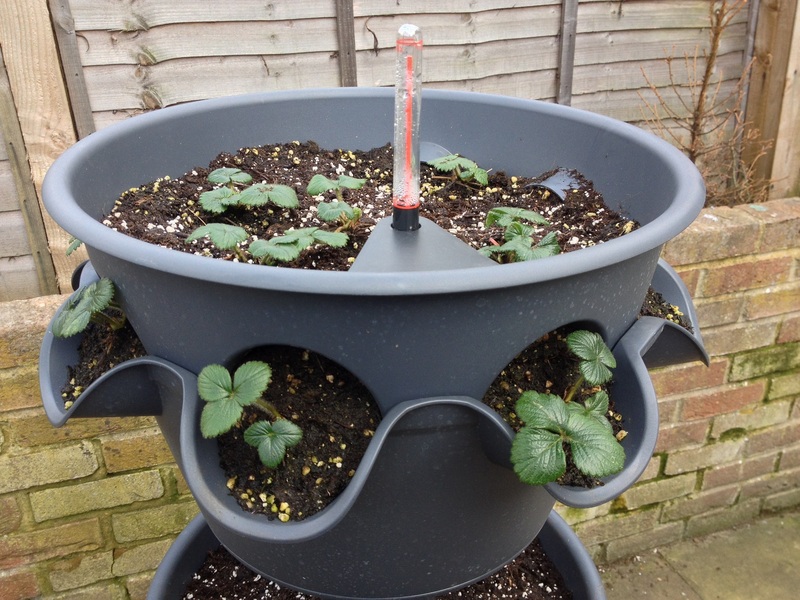 Middle tier water level at minimum, plants need watering. 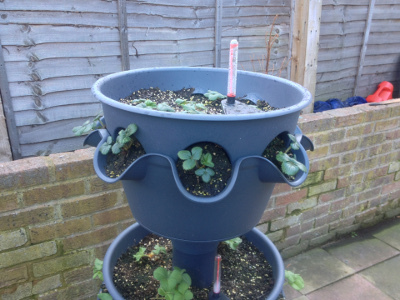 Bottom tier water level at minimum, plants need watering. 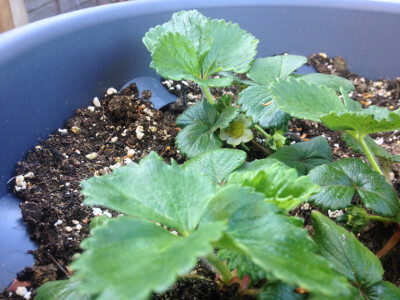 Flower petals about to fall off a strawberry flower. 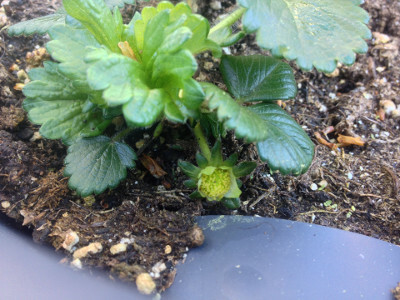 Second strawberry flower bud has almost opened. 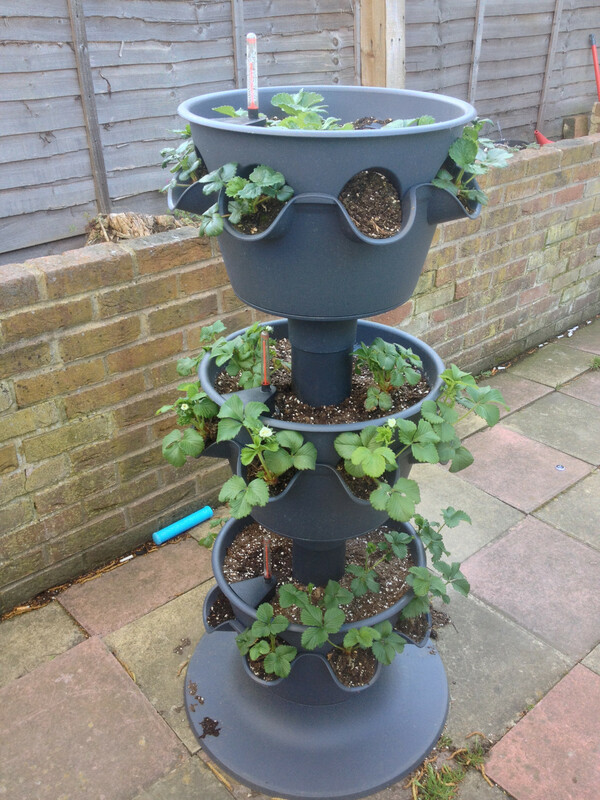 3-tier strawberry planter rotated and plants watered. 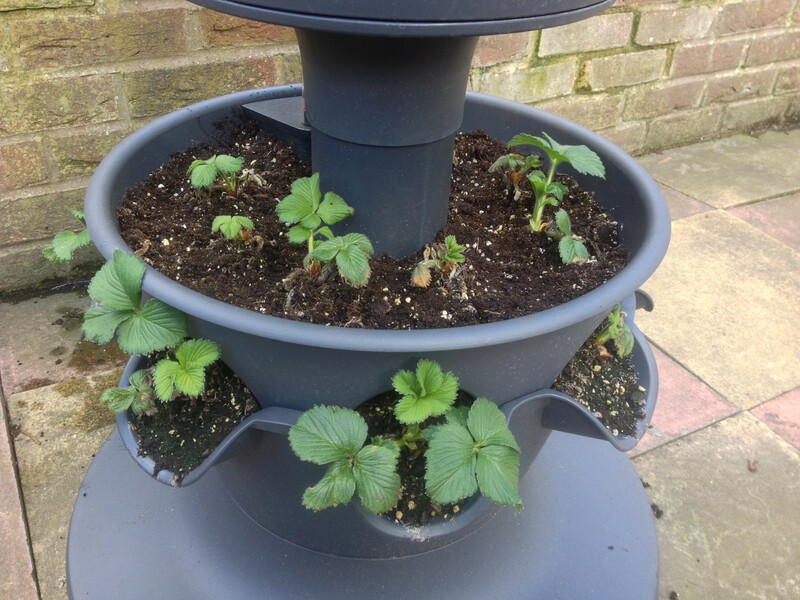 3-tier planter strawberries showing a little growth. 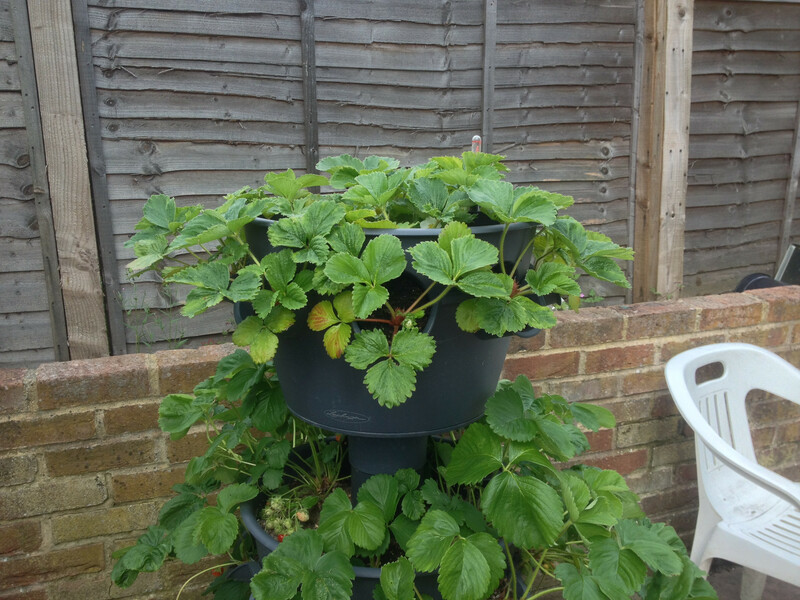 Top tier strawberries looking OK.
Middle tier strawberries looking OK.
Bottom tier strawberries looking OK.
Top tier water level at medium. 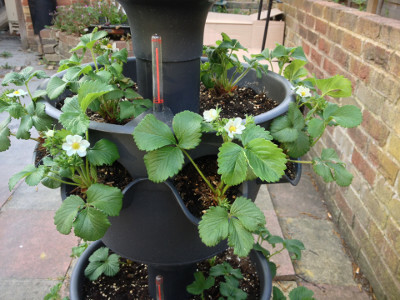 Medium tier water level at low. 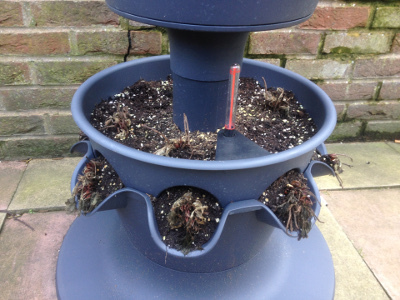 Bottom tier water level at low. 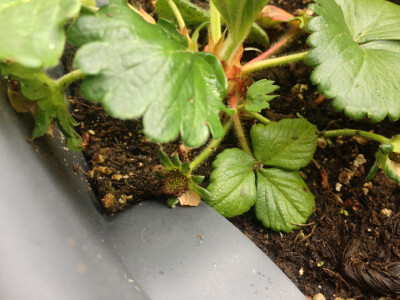 Another strawberry bud is developing. 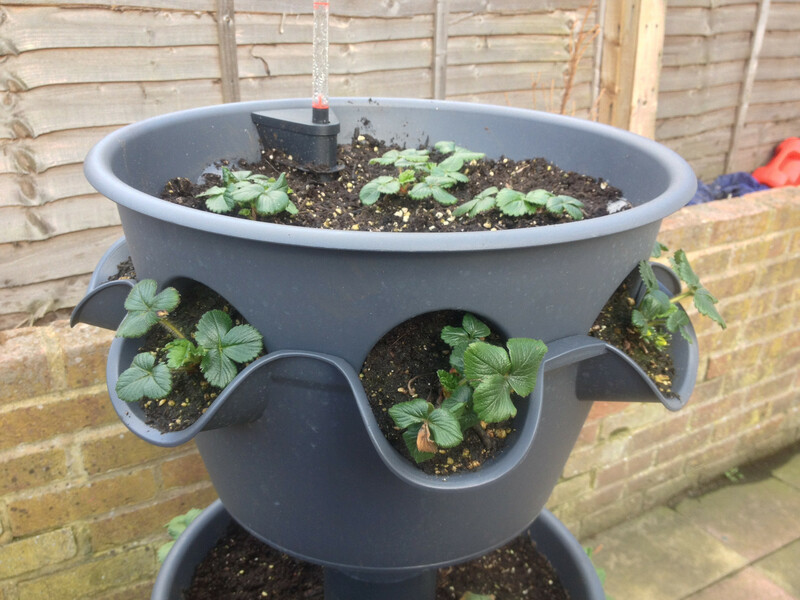 3-tier strawberry planter cleared of leaves and rotated. 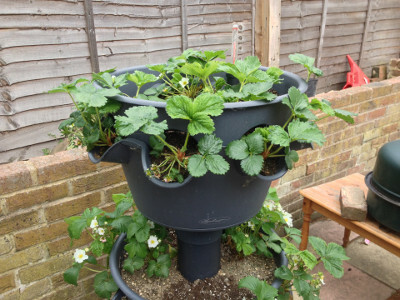 Top tier planter at moderate water level. 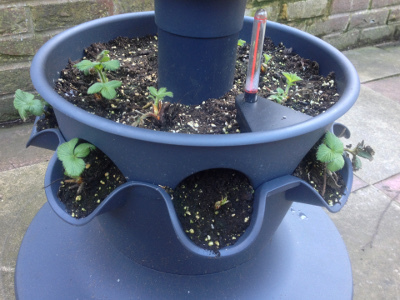 3-tier planter 6 days after planting. Bottom tier 6 days after planting. 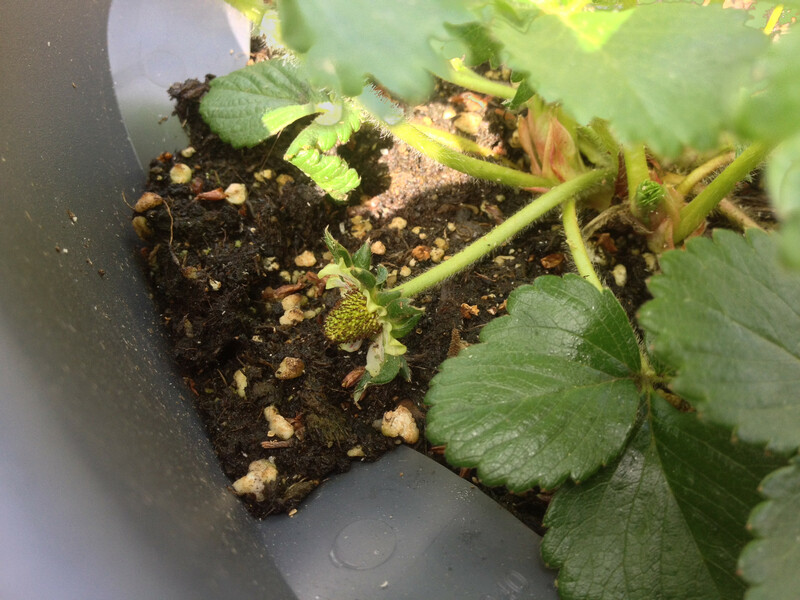 Middle tier 6 days after planting. 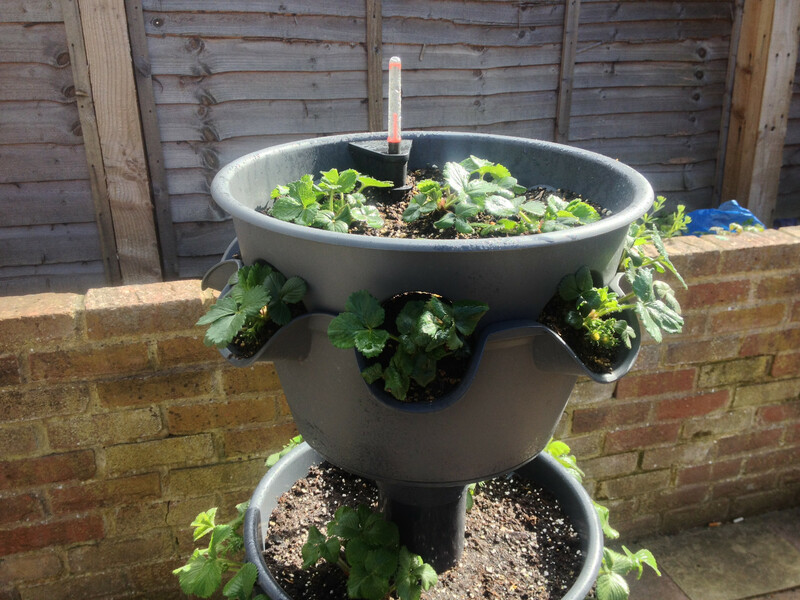 Top tier 6 days after planting. Middle tier's water level is low. 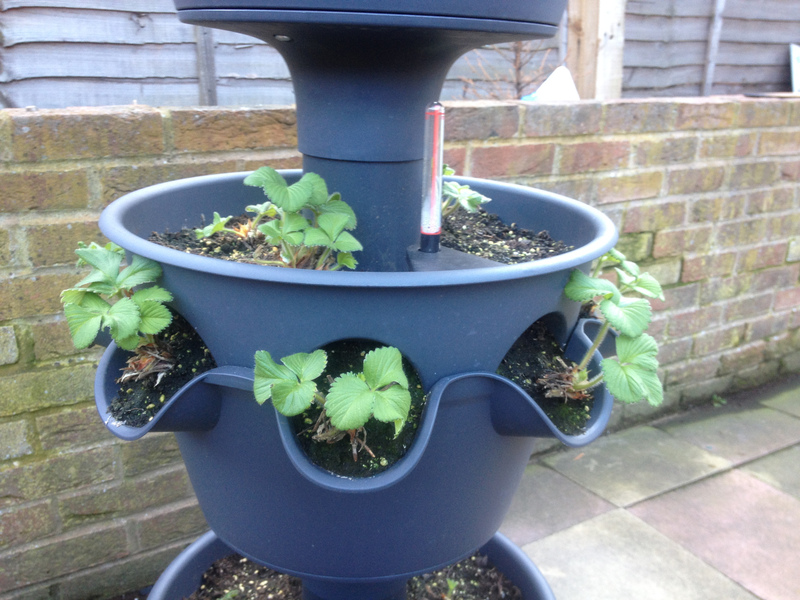 Bottom tier's water level is low. A flower bud on one of the strawberry plants. 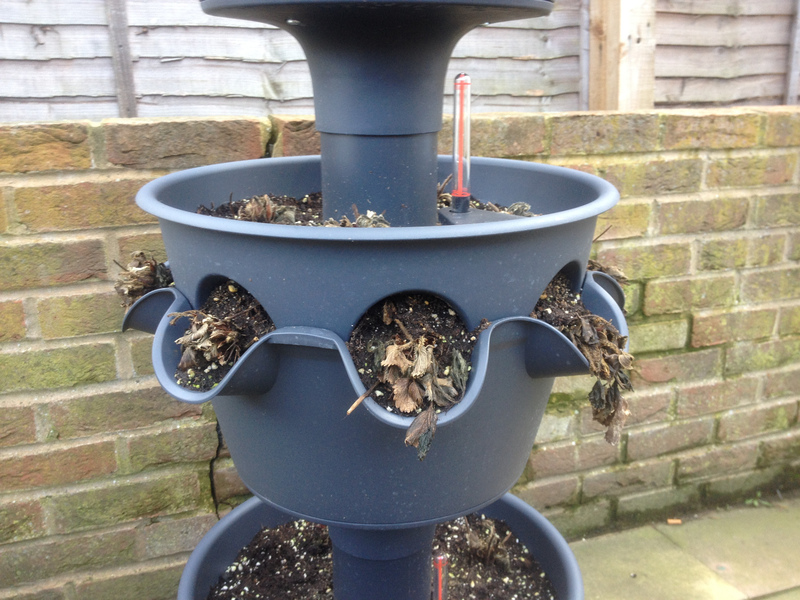 3-tier planter cleared of fallen tree leaves and rotated 90 degrees anti-clockwise. 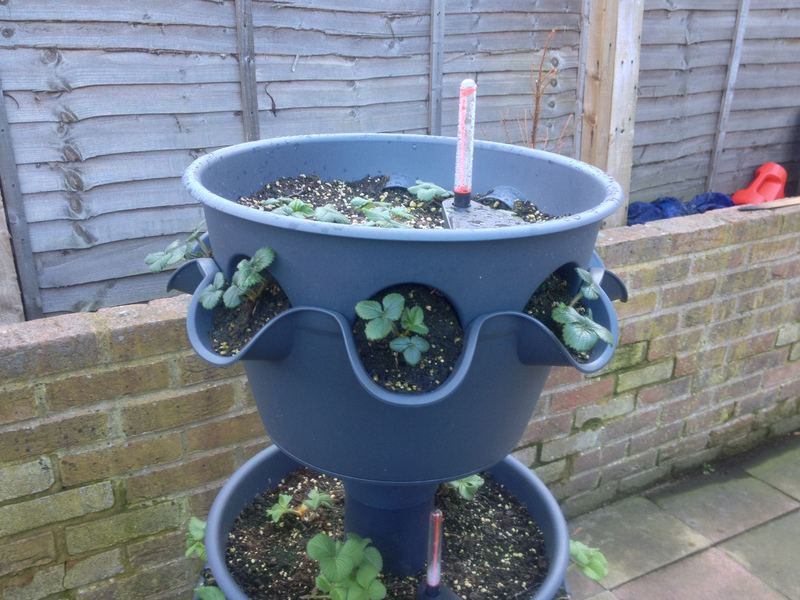 Bottom tier 1 day after planting. Middle tier 1 day after planting. 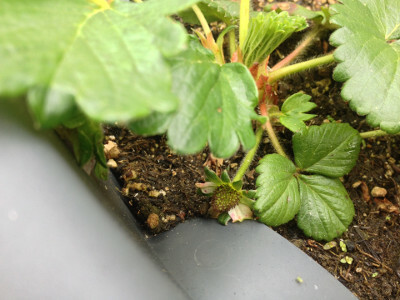 Top tier 1 day after planting. 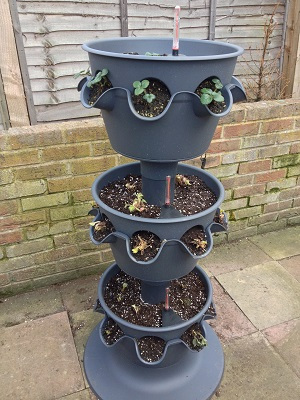 Bottom tier assembled and ready for compost and plants. Bare root strawberry runners for bottom tier having their roots soaked in a caserole dish. Bottom tier assembled, filled, and watered. 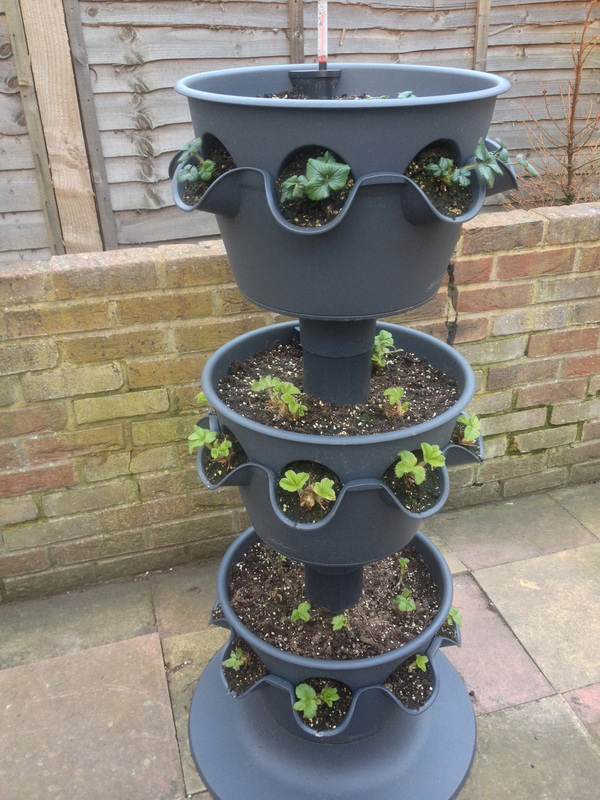 3-tier planter assembled, filled, and watered.